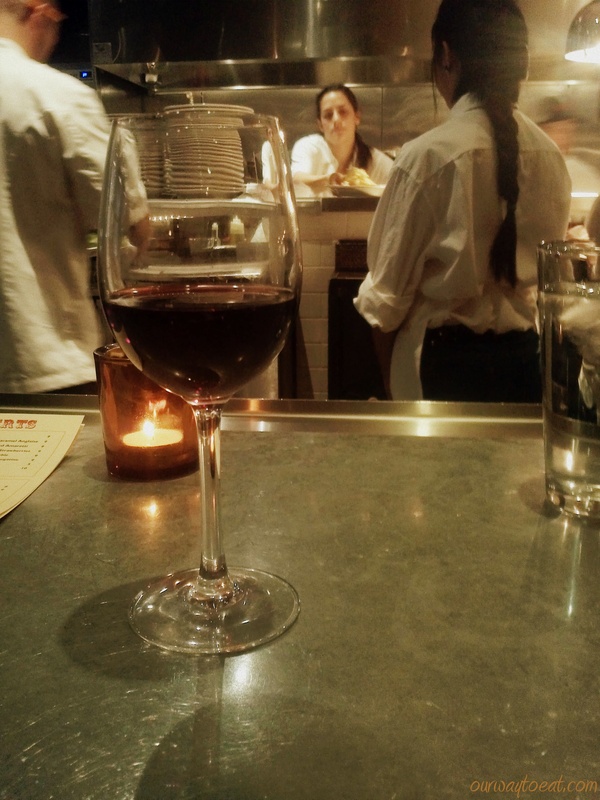 We’ve been to Bar La Grassa a handful of times. It is one of my favorite places to go out to share a special meal. Why? 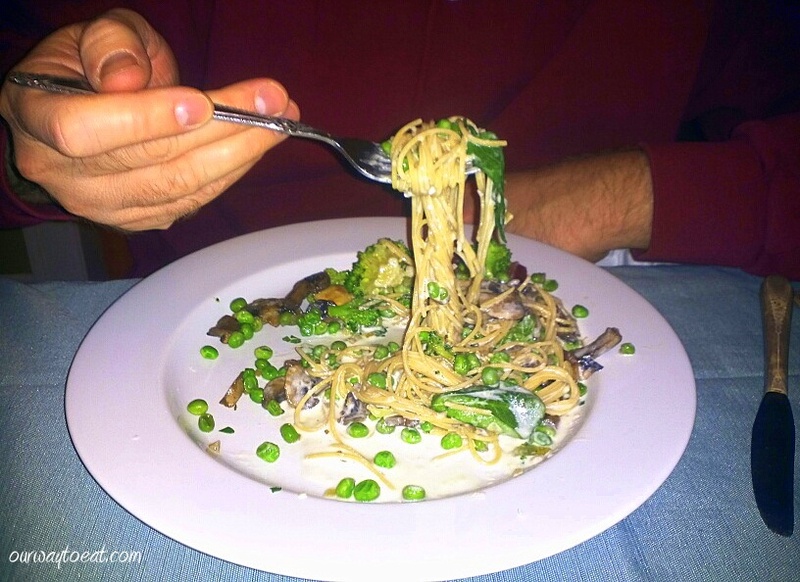 I am universally pleased by fresh pasta and that, combined with Bar La Grassa’s bustling atmosphere makes for an enjoyable dining experience. When it is just the two of us, we usually choose to sit side-by-side at the long counter that separates the kitchen’s front line from the central dining room. 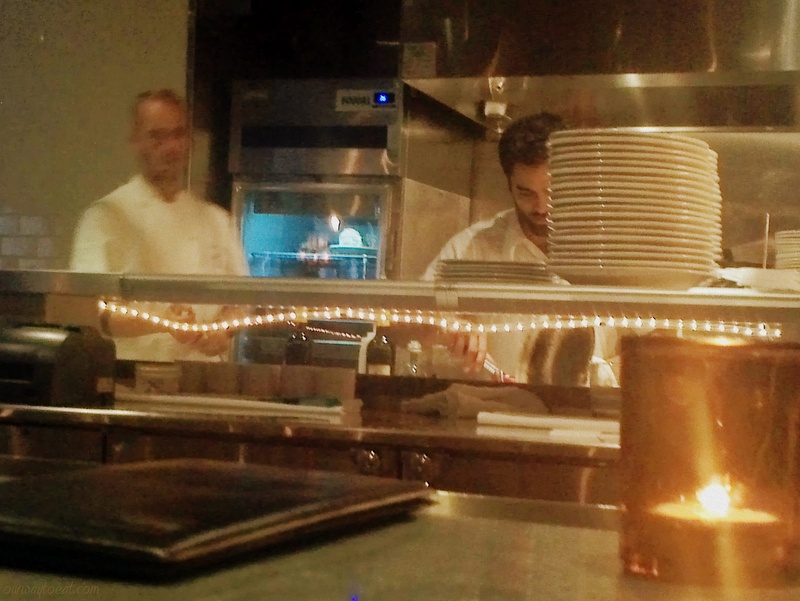 An open-kitchen in a nice restaurant is no longer uncommon, but spending the meal perched directly at eye-level with the kitchen staff in the midst of busy preparation makes for a fascinating, voyeuristic experience for a diner who is interested in the process behind the product. To me, the front-row vantage point is a marvel. There is constant, well-choreographed motion. Each person moves though the rhythms of their kitchen duties with the calm agility that comes from practice and repetition. This kitchen’s output is impressively efficient and quite tasty. Bjorn has occasionally ventured into somewhat adventurous territory, ordering the braised rabbit and sweetbreads that make their way on to the menu. Tonight, we decided to share a few small plates, so he stuck to the meat-free options. Everyone and their brother crows from the rooftops over the Lobster and Soft Egg Bruschetta at Bar La Grassa. I have no doubt that its is amazing. I’ve found that the other somewhat uniquely topped bruschettas are also fun to try. 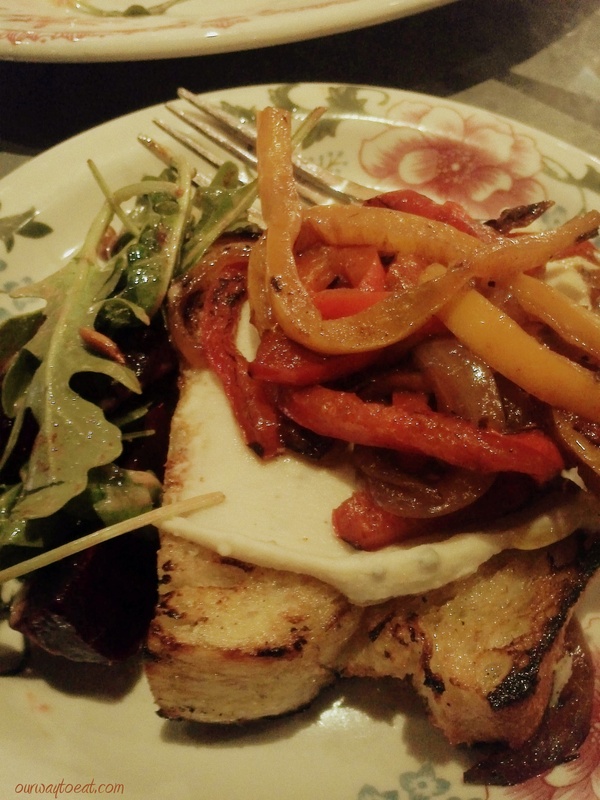 We sampled the Gorgonzola Picante Bruschetta with Peperonata. The thick slices of bread, grilled before our very eyes are rustic and ample, and the slight char is lovely. For once, a bruschetta that has enough bread to hold its toppings! It’s the little things in life, isn’t’ it? 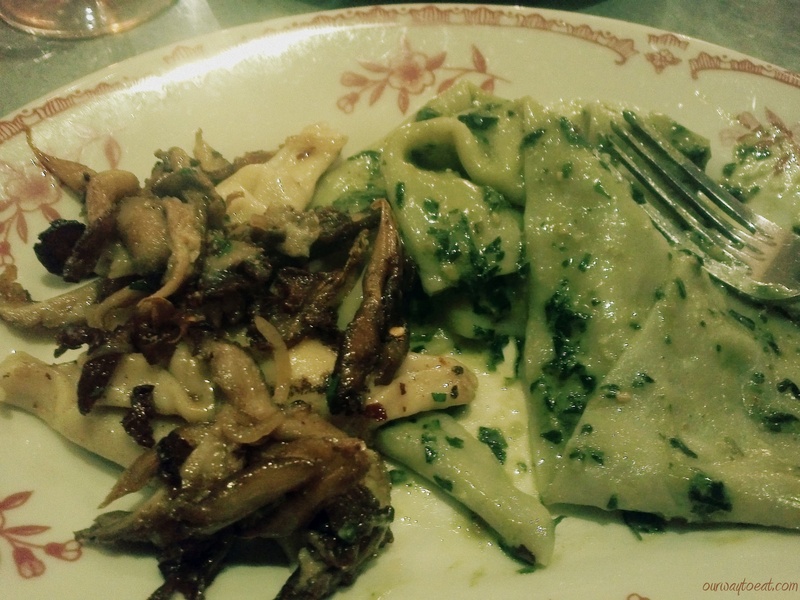 Our second pasta selection, from the “filled pastas” category on the menu was the Mushroom and Tallegio Agnolotti. We both liked this dish though by the end, I thought the mushrooms were over-salted. 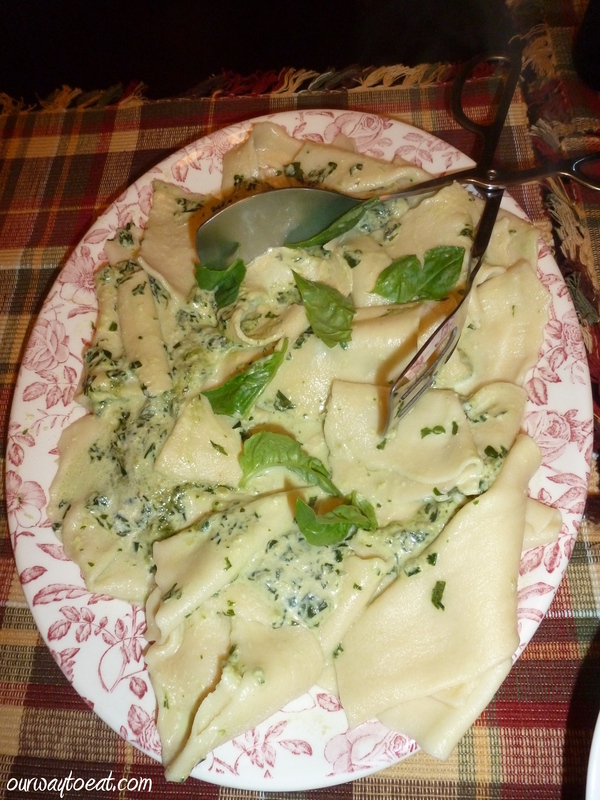 The wrapped-candy-shaped Agnolotti were tender and filled with a perfectly lovely Tallegio. This was Bjorn’s favorite dish of the meal. One of the feats Bar La Grassa has somehow managed to accomplish is to be at once swanky and unpretentious. To me, this is the perfect combination of characteristics for a restaurant in the Minnie Apple, the hip-n-homey heart of the Midwest. The the restaurant has the typical “see and be seen” vibe of an upscale restaurant yet the hosts are welcoming and always find us a place even when the median fashion sense of the restaurant’s clientele eclipses ours. I have, in fact, seen and said a quick “hello” to Minneapolis food personality, Andrew Zimmern during a previous visit with Bjorn and my mother. In contrast to the overall swankiness, I’ve dined next to a couple decked out in Minnesota Golden Gopher gear from head to toe. The highfalutin to homespun contrast also comes through in the restaurants serving ware. If you are looking at your plate, you might think you are dining in the humble kitchen of an Italian Grandmother rather than the spacious dining room of Isaac Becker, a James Beard Award-winning chef. All the food comes out on heavy, standard-issue restaurantware plates with all varieties of patterns. There is also the pleasant contrast between the kitchen’s credentials to price. The head chef and the restaurant have received plenty of accolades, however, it is possible to have an appetizer, a few small plates and a few glasses of wine or beer and dessert, and still spend under one hundred bucks. And to leave totally satisfied. 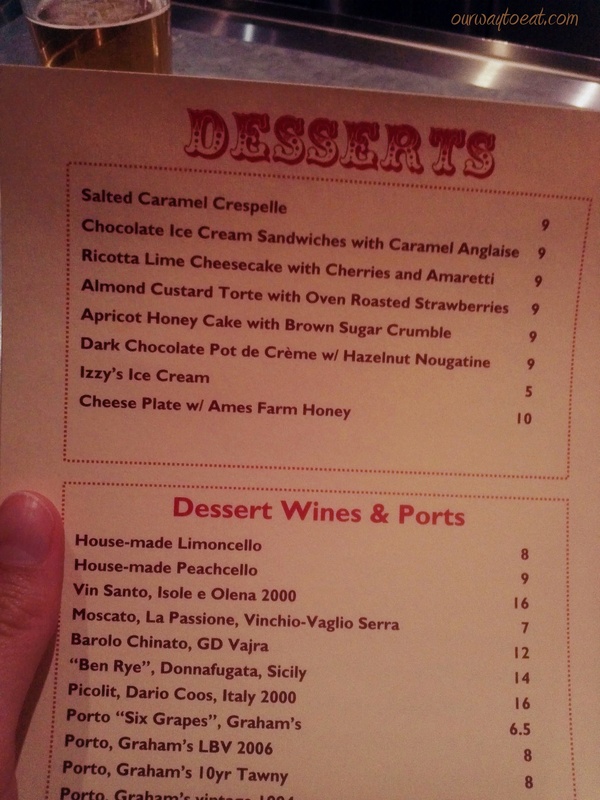 We don’t often order dessert, but because of sharing small plates, we still had room. We selected the luscious, Dark Chocolate Pot de Crème with a Hazelnut Nougatine which was a magnificent finish to our meal. 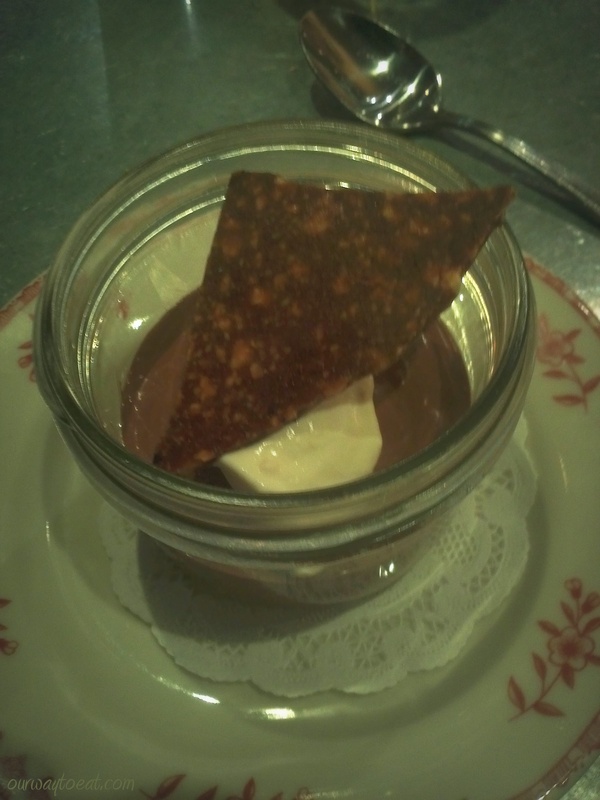 I love the fact that it was served in a little canning jar. 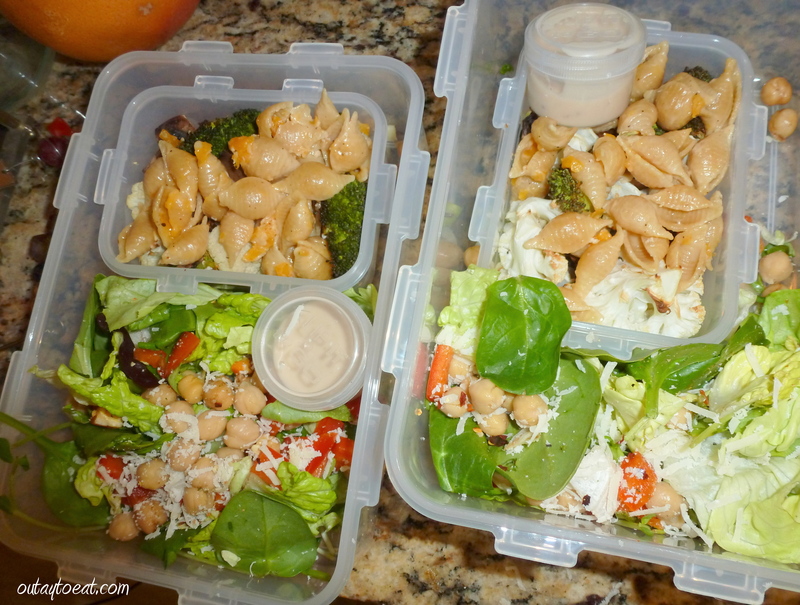 I stole this idea from Wise Acre Eatery and used it all summer to serve individual portions of salad and condiments. I loved the Pot de Crème. What a treat. We have found that Bar La Grassa consistently offers a solid Italian dining experience. Bar La Grassa’s execution and noble parentage thoughtfully contrasts with its “room at the counter” welcome and good value. Given the opportunity to gawk into a high-end kitchen while dining from a menu curated by a James Beard award-winning chef, will we go back? You betcha. *For the record, I used my phone without flash to capture these quick shots, so they are a little lower in quality, but I’m not going to be that person who totally irritates her dinner date and other guest by noticeably photographing her meal. But really, who isn’t documenting absolutely everything these days? If Adam Roberts from Amateur Gourmet does it, why can’t I? I’m crazy about growing-my-own-everything in my backyard and making bread, pasta, cheese and beer from scratch. I follow approximately 40 food blogs [and counting…], I’ve spoken to Anthony Bordain* and I’ve introduced myself to Andrew Zimmern. Cookbooks by Brenda Langton, Sophie Dahl and Ina Garden frequently show up on my cookbook stand. Even so, this post could do away with any possibility of earning recipe-developer cred or gaining respect as a highfalutin foodie. 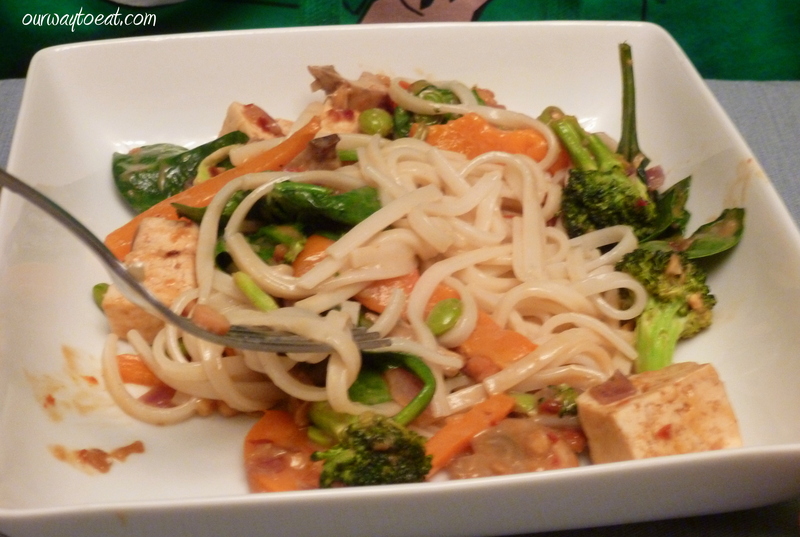 I’m sharing a recipe that is based on my favorite dish at Noodles and Company. Noodles and Co.?! Yes. So what? I did my best rendition of Noodles and Company Pesto Cavatappi and it was totally delish. 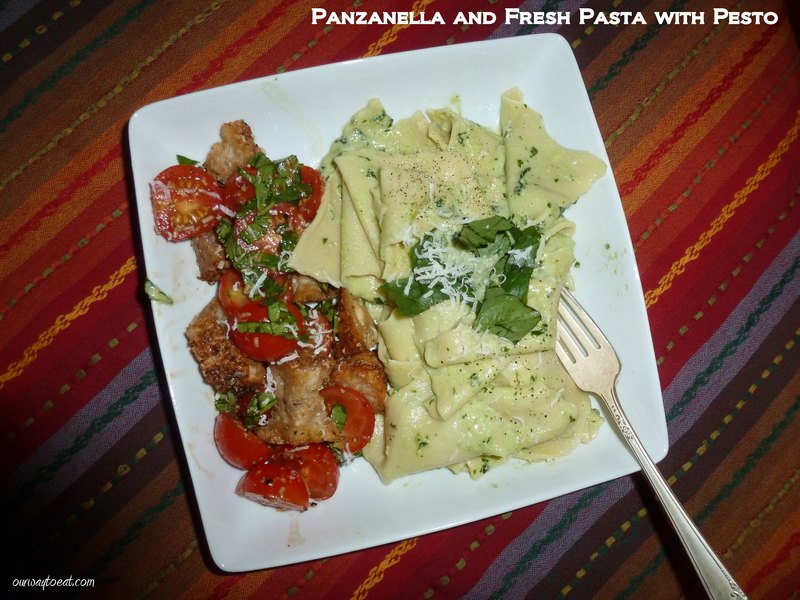 To make this dish, I started by roasting tomatoes and making a batch of basil pesto. These are two steps that you can complete in advance since you can store both pesto and roasted tomatoes covered in olive oil in the fridge for a few days for use in multiple dishes. If you roasted a bunch of tomatoes based on the recipe I posted last week, this dish is an excellent way to use the leftovers. 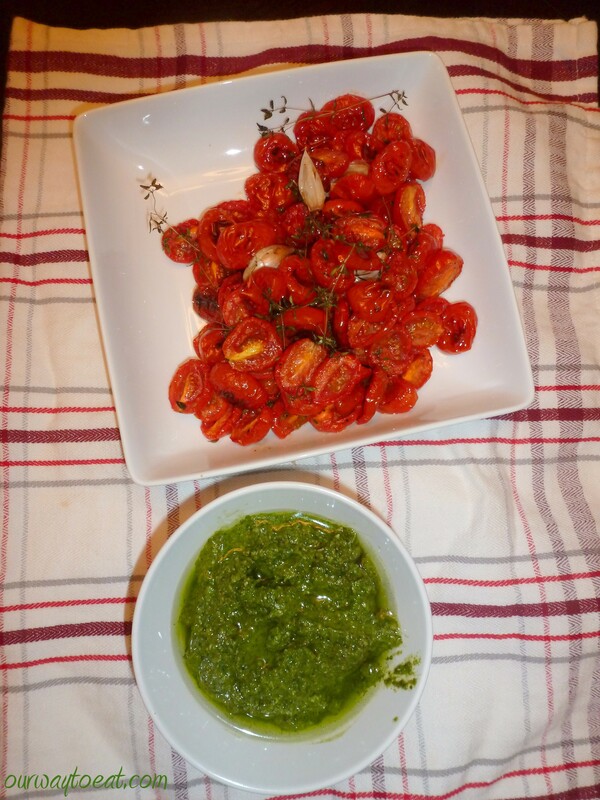 Please refer to my method for making wonderful Basil Pesto and Roasted Tomatoes recipes in the linked posts. It takes an hour to roast tomatoes, so if you haven’t done that in advance, start there first. FYI, Noodles and Co. doesn’t use roasted tomatoes, so roasting the tomatoes is optional for this recipe. I think roasting the tomatoes is worth the effort. Shriveled, roasted tomatoes make their presence known in the dish with a sweet, concentrated tomato flavor. They also contain less liquid to dilute the basil-y, Parmesan cheese-y, garlic-y goodness of the pesto. If you’d rather, you can simply add grape tomatoes to the sauté pan (more on that in a minute), and sauté the ripe red beauties until they are softened and bursting, and adjust the amount of pasta water you use to thin the pesto to avoid having a runny sauce. 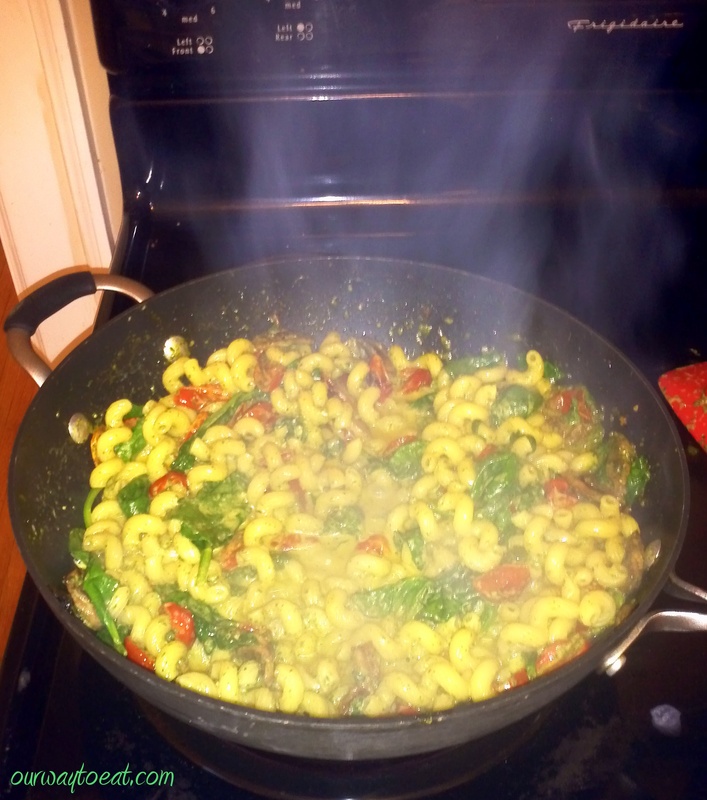 Pesto Cavatappi in the style of Noodles and Company — 1 hour total time, 30 minutes active time, serves 4 — easily doubled. 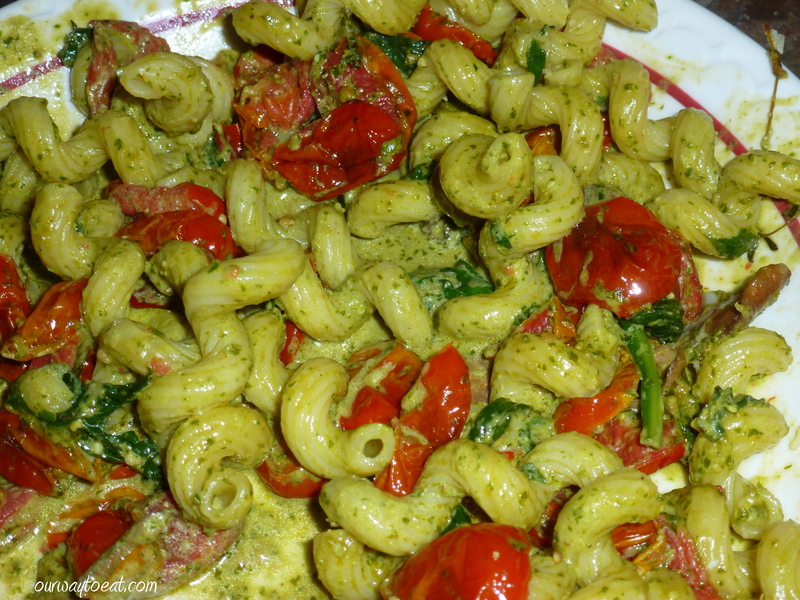 Once you have made basil pesto and roasted tomatoes, the recipe is very simple and comes together quickly. Cook half a box of curly cavatappi noodles in salted water according to the package directions to a little less than done. At the same time, mince and sauté two cloves of garlic and 8 ounces of sliced, clean, button or cremini mushrooms in a little olive oil. If you are not using roasted tomatoes, you can add a few handfuls of grape tomatoes during this step. I think a minced, sautéed shallot would also fit the flavor profile. 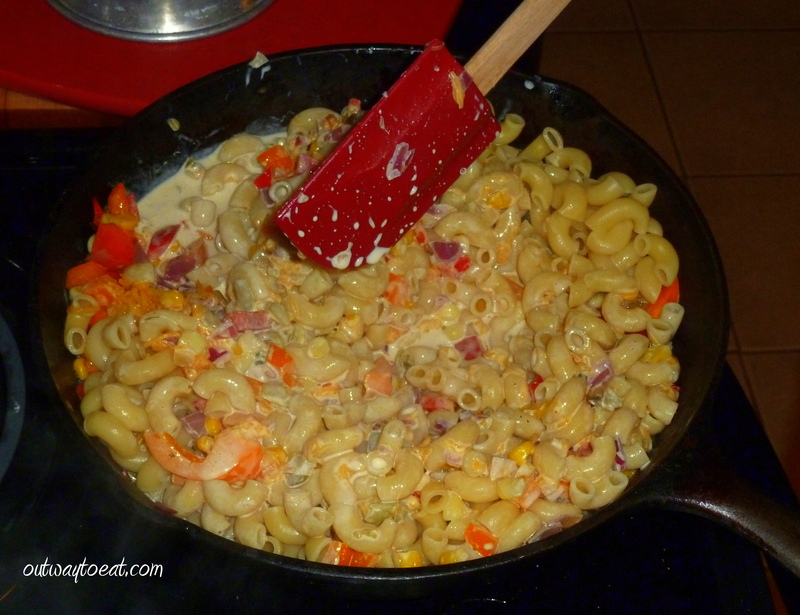 Once the veggies are mostly cooked, you can add a splash of white wine to the hot pan to develop flavor and get all of the good cooked bits off the pan–I didn’t bother with this, even though the official Noodles and Co. Cavatappi claims to contain white wine. Its presence or absence is not noteworthy. When the noodles are nearly cooked, drain them, reserving some pasta water. Next, toss the noodles, pesto and sautéed veggies together in the sauté pan, and stir gently. If you are using roasted tomatoes, they should be added at this point. 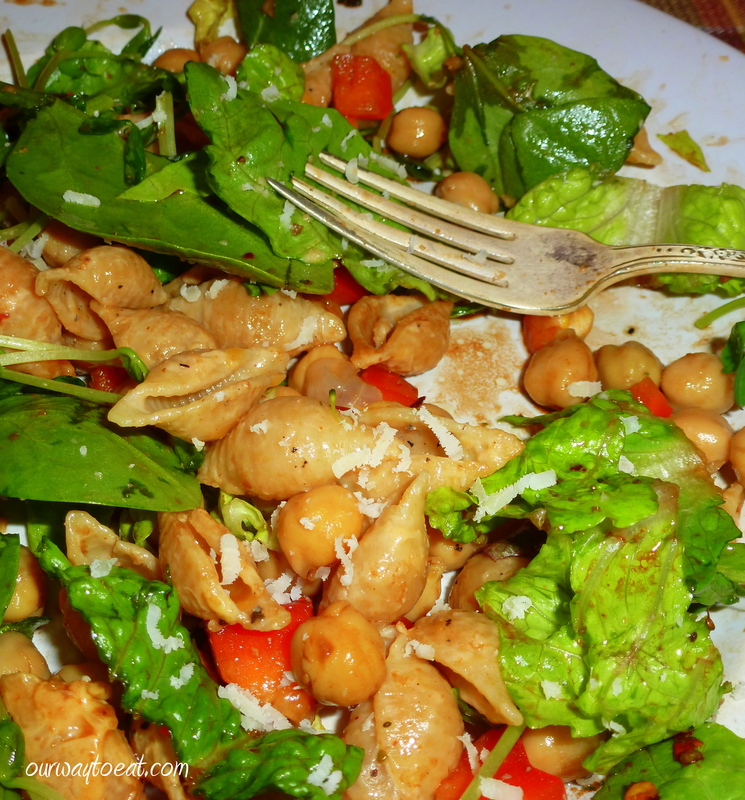 I also added two big handfuls of baby spinach, which is not in the Noodles version of this dish, but is a tasty, healthful addition to this meal. I added a little of the pasta water to thin the pesto and to allow the Parmesan cheese in the pesto to melt. When everything is covered in a light coating of green and the spinach has begun to wilt, add a touch of milk, half and half or cream and stir until incorporated. 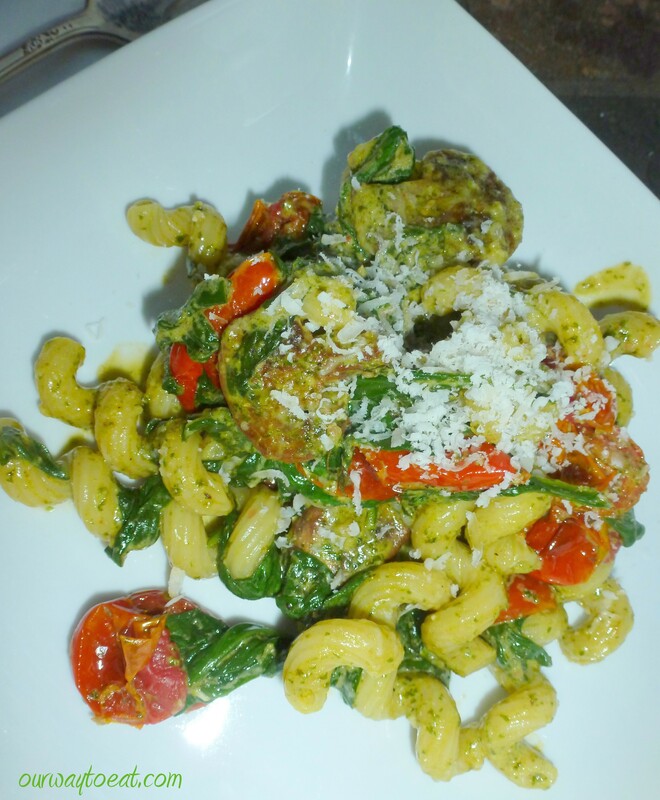 I served my pesto cavatappi topped with a little grated Parmesan cheese. To really bring the Noodles and Company flavor home, you can also sprinkle on a little chopped Italian flat leafed parsley. I did not. There is so much flavor in the verdant pesto, and the sweet tomatoes which are roasted with garlic and thyme and layers of garlic flavour from each component of this dish I didn’t think more herbs were needed. 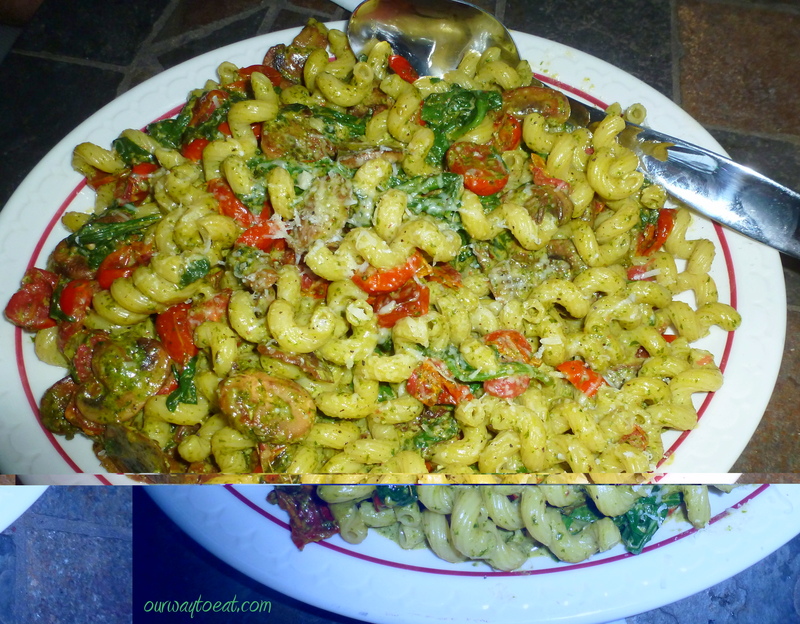 To truly capture the Noodles and Company Pesto Cavatappi, add a little parsley, finely chopped. 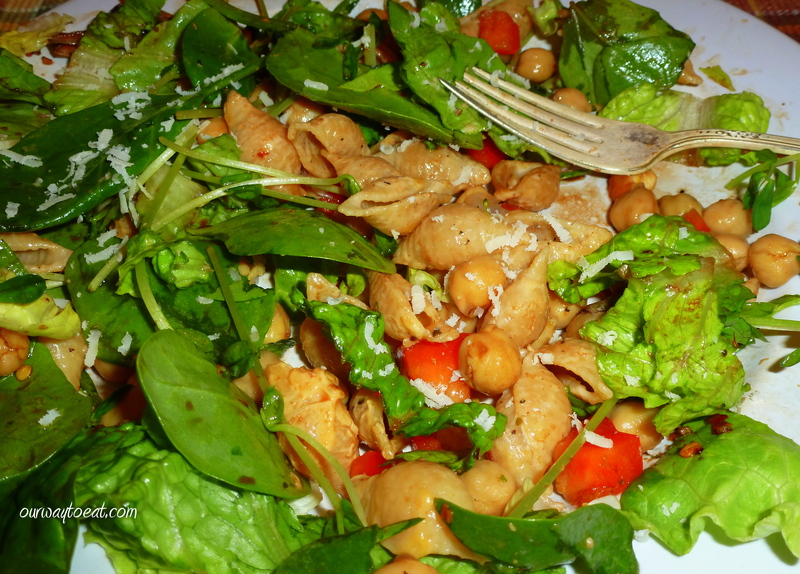 While making this meal I realized that having luscious pasta available as fast food can be bad for your health. As much as I enjoy Noodles and Co. now and then, I know what makes it taste so good: olive oil, cheese and cream, [or half & half or milk if you use my recipe]. That stuff should be reserved for extra special meals. 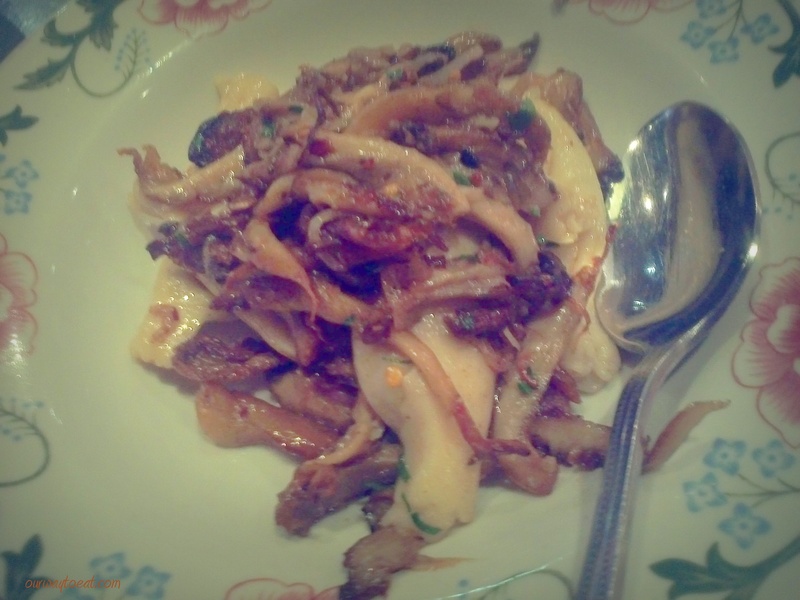 I think it is wonderful pasta to enjoy occasionally. Just don’t start going to Noodles and Company, ordering Pesto Cavatappi and thinking that’s everyday food unless you are an Olympic swimmer, marathoner, or someone else with extreme calorie needs. This recipe is fit for a special meal, or if it is just an average Tuesday, served in a smaller portion alongside a salad. 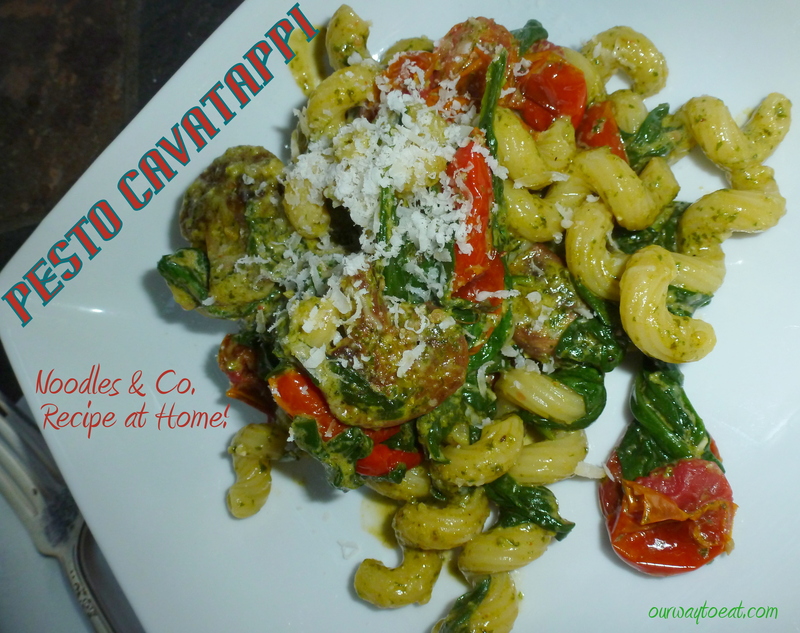 Our Pesto Cavatappi was really tasty, and even with my tweaks to the ingredient list it was a lot like Noodles and Company, but better, because it was lovingly made at home. *Alright, I’ll be straight. I asked Anthony Bordain a question in a Q&A session when he was in Minneapolis on a speaking tour. My question was about the John Spencer Blues Explosion song which is the theme song to his show on the Travel Channel. He kind of blew off the question and failed to answer which I’ve interpreted in several ways that all cast doubt on his self-proclaimed interest in awesome music. We’re celebrating our 3rd anniversary today. 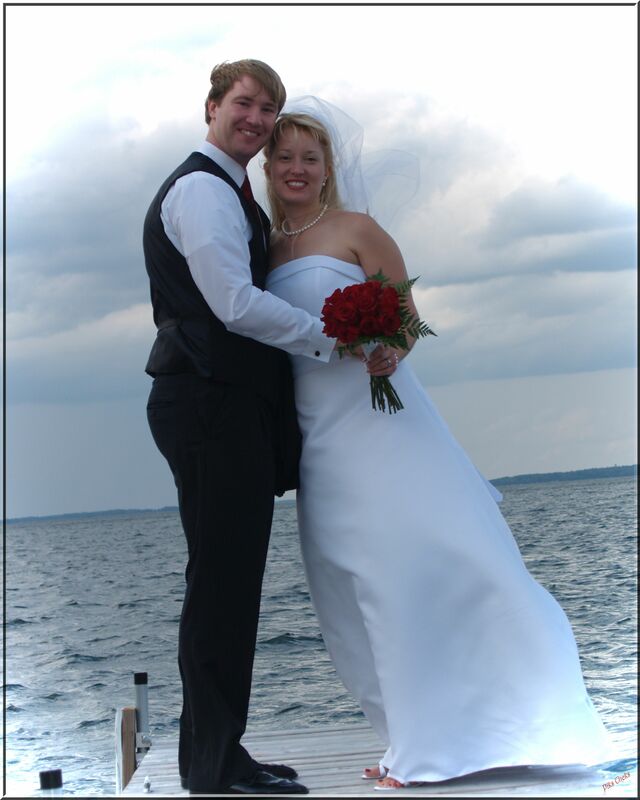 It is fun to look back on our wedding day which was such a perfect, awesome and fun-filled kick-off to our married life. We worked hard to fill the day with thought and meaning. We were surrounded by awesome family and friends who traveled far and wide. It turned out to be one of the greatest days–special from start to finish. It was pretty much perfect–except for my bangs in the above picture… not sure what happened there. What has followed has been wonderful. Married life is a fun adventure! Thank you Bjorn for 3 great years! I am grateful for every day I share with you. A few weeks ago, we found ourselves in Walker, Minnesota for a friend’s wedding. Walker happens to be the town where our wedding reception took place at a historic resort and hotel, Chase on the Lake. With our anniversary approaching Bjorn suggested that we have dinner at Chase to start the celebration early. Good call Bjorn! Our meal was fabulous. We dined on the patio overlooking Walker Bay on beautiful Leech Lake, and had one of the best restaurant meals we’ve had in while. We started with a 2009 Pinot Noir, which has proven to be a good vintage. Bjorn had Surf n’ Turf– a New York Strip steak bathed in herbed butter and served with garlic mashed potatoes, roasted root vegetables and an impressive pile of crab legs. Bjorn cracked into the crab legs with gusto. We learned in Croatia, the only way to approach the shelling of shellfish is with gusto. I had a brightly flavored pesto fettuccine with veggies and a caesar salad. The meal was tasty! We enjoyed being in the place where the celebration began and raising a toast to all the fun we have ahead. Cheers! 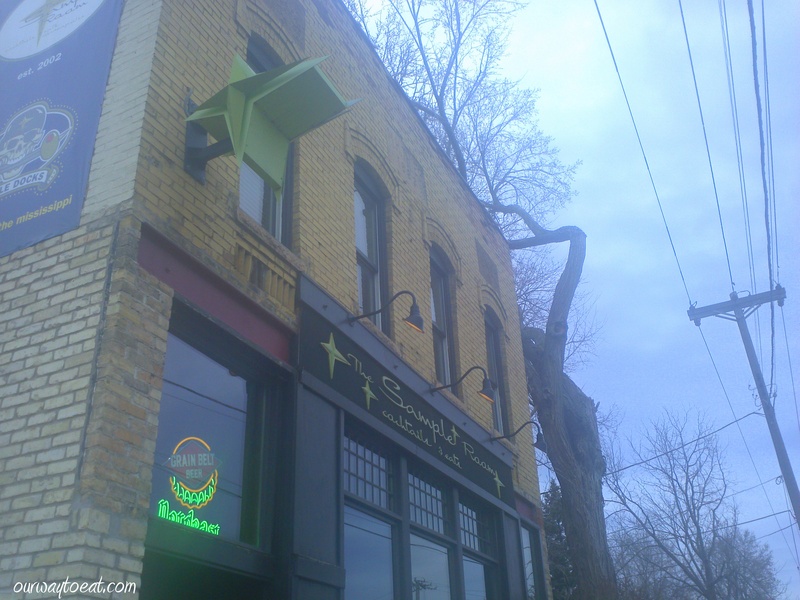 This is the second in a short series of posts about a few restaurant experiences we’ve had around the Twin Cities in recent months. I read about Cat Man Do a few months ago on a local food blog that I like to visit and knew it was a place we should try. 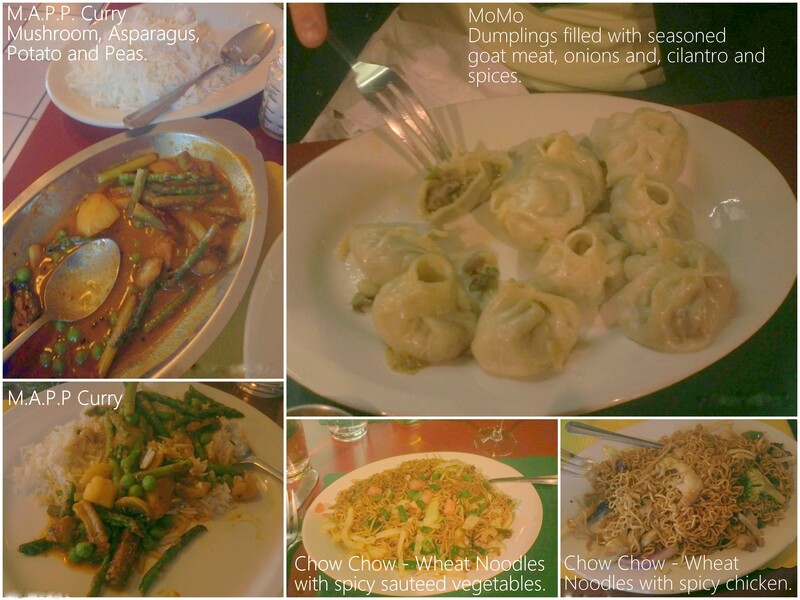 Cat Man Do is a cozy restaurant in our neighborhood that offers authentically prepared Nepali food. 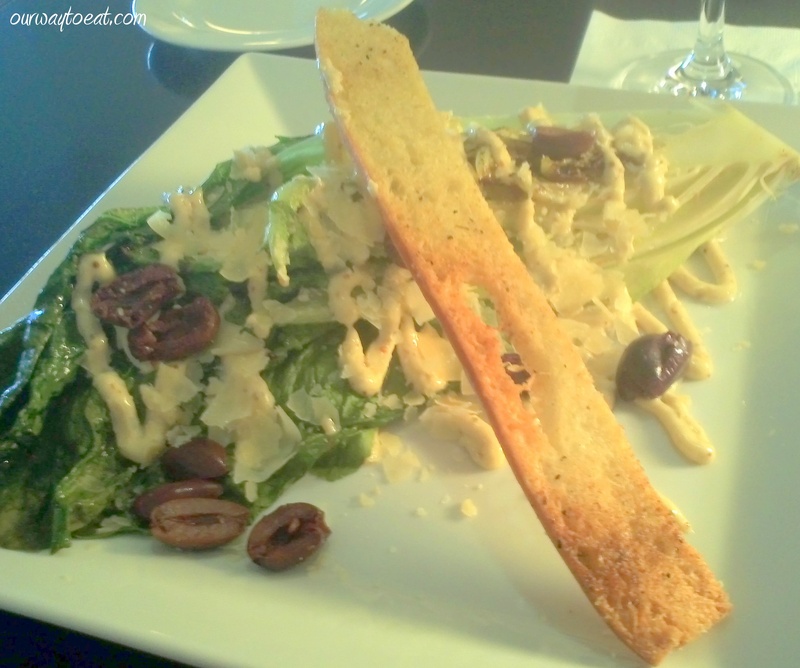 Its menu is filled with interesting choices for vegetarians and omnivores alike. We have now eaten there twice, and we enjoyed both meals. After our first visit, I woke up the next day craving another Samosa, a savory pouch stuffed with potatoes and peas, served with a spicy-sweet sauce (not pictured) and considered going to the lunch buffet solely for the purpose of having another one. On our first visit, I tried the Chow Chow noodles with vegetables with medium spice. The noodles were pleasantly spicy, but I wouldn’t be shy about ordering them hot in the future. Bjorn tried Mo Mo, a steamed dumpling, shaped into a little coin purse stuffed with seasoned meat. On our second visit, Bjorn ordered Chow Chow with chicken, and I ordered M.A.P.P. curry with mushroom, asparagus, potato and peas which had a wonderful balance of warming seasonings. On both occasions the dining room was nearly full, about half of the diners were college age and half were couples in their twenties through middle age. This is both a fair representation of the neighbourhood’s residential composition and a testament to the tasty, enjoyable and interesting menu choices, and the reasonable price point at Cat Man Do. Cat Man Do has earned a regular spot on our Saint Paul dining rotation. We enjoy the satisfying, well-seasoned dishes at Cat Man Do. Cat Man Do offers different flavors and preparations than the food we make at home, with results that are no less homey, craveable, and comforting. One rainy Sunday we went out for a drive in North East Minneapolis. We had no particular destination in mind, but we knew dinner would be involved. There are many solid options that we’ve enjoyed in visits to this neighbourhood, Psycho Suzi’s, The Modern Cafe, Northeast Social, Mill City Cafe, The Red Stag, and The Bulldog Northeast are all reliably good. On this particular evening, we ended up at the Sample Room. We’ve driven by many times on our way to listen to music at 331 Club, and finally managed to stop in for a meal. 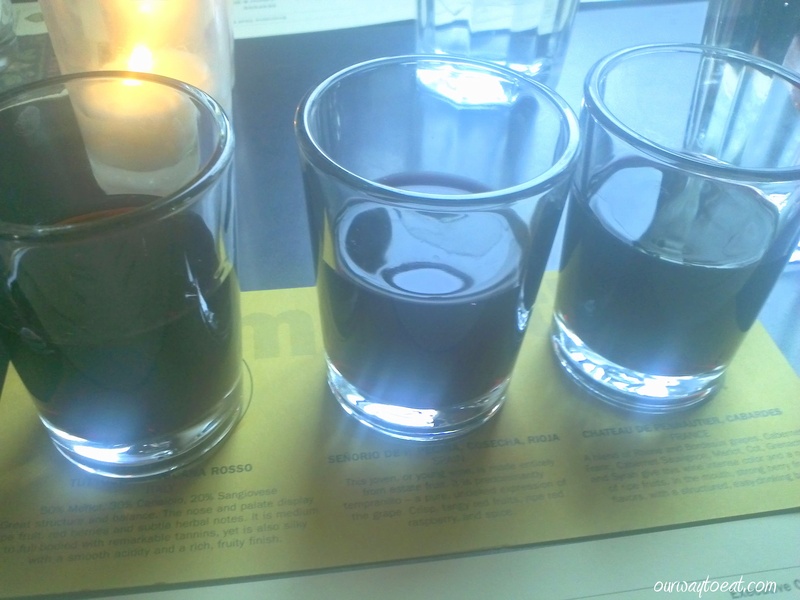 I started by ordering a flight of wine. When it arrived I stopped taking pictures. Oops. The aptly named Sample Room offers small plates of cheese, charcuterie, pasta, salads, meat, seafood and vegetables and a variety of interesting condiments, made in-house. We started by sharing a house salad of mixed greens, aged ricotta, red onion, radish and pepitas with a red wine vinaigrette and a “Pickled Plate” which included pickled egg, an assortment of pickled veggies and mustard. For my “main” I had the fresh fettuccine with wild mushrooms and kale in a sauce of chive crème fraîche, butter and white wine garnished with shaved parmesan and cracked black pepper. I liked the fettuccine, but I didn’t love it. I am pretty spoiled these days when it comes to fresh pasta. Between living down the street from Scusi where you can get a killer fresh pappardelle any night of the week, the wonderful bowl of egg fettuccine with green garlic and grape tomatoes I recently enjoyed at Broder’s Cucina Italiana, and the pretty darned good pastas I’ve been rolling out at home, I have a high bar for fresh pasta. Maybe I’m being too hard on the noodles, the real issue I had with the pasta was the kale. I’m afraid to admit this for fear of losing all of my vegetarian cred, but I’m not sure that I’m sold on kale. Admittedly, I haven’t made much of an effort to fall for this frilly, dark, cabbage-like green. The kale on my fettuccine makes a good example of why I have a hard time jumping on the kale bandwagon — it had a mineraly-metallic taste that almost reminds me of meat. The difficult flavor and texture of kale overpowers whatever feel-good vibes eating this super-nutritious green gives me. In further damage to my vegetarian rep, I feel the same about collards. I’ll stick to spinach, thank you very much. I can’t blame the Sample Room for my personal views on the vegetable in a dish I opted to order, unless they sautéed the kale in a cast iron or aluminum pan which would be the cause of the pervading iron / B Vitamin flavor in the dish. Bjorn had crab cakes and the Bison-Pork-Beef Three Meatloaf with smoked tomato ketchup, which was recently named the “Best Meatloaf in the Twin Cities 2012” by the Citypages. Bjorn liked the meatloaf and as wonderful as it probably is, I cannot believe the Best Meatloaf in the Twin Cities isn’t made by somebody’s mother! My mother’s meatloaf would surely be a contender if she made it in the Twin Cities and I hereby give it an unofficial nomination for Best of the Twin Cities 2013. What is more, I cannot believe “Best of” rankings include meatloaf! It seems like we’re going a little far with that, but I wouldn’t have been shocked if “best bike rack” made the list, so I guess meatloaf deserves its place. The Sample Room gives you the opportunity to sample a variety of their local charcuterie, house-made pickled things, unique condiments and interestingly prepared meats and seafood offerings without committing to a massive portion or price. It is another solid spot to add to the list of reasons that that Northeast Minneapolis is one of our best ‘hoods. Next on our Twin Cities tour is a lunch I had last week by myself at Basil’s, a slick restaurant circa yesteryear in the Marquette Hotel in Minneapolis, overlooking the Crystal Court in the IDS Center. For out-of-towners, the IDS Center is the tallest building in Minnesota, and provides office space to scores of law firms, stockbrokers, venture capital firms and consultants of every ilk. I chose Basil’s blindly, wanting to eat a salad in a calm place where I could write at noon on a Wednesday. I found my way to Basil’s on the third floor taking the elevator in the hotel lobby and requested a table for one. The host honestly seemed a little freaked about my request and spent several minutes nervously scrolling through his computer screen, uttering “uhhhh.” I didn’t know how long this would continue so I interrupted to ask if the restaurant was booked with reservations. He finally took the cue and showed me one of many open two-seater booths, which was in fact, kind of perfect for one person. I chose to sit with my back to the kitchen door, instead of facing it where he had directed me. There were a few more “uuuhs” and he told me to sit on whichever side I felt comfortable sitting. I got the feeling he was maybe a bit uncomfortable with me having lunch by myself. I waited quite a while before my presence was noted by a server. By now, my discomfort was mounting. I looked around the room and realized that the only escape was the elevator bank past the host stand, so there was no turning back on lunch without even more awkwardness. When my waitress arrived, she was warm, experienced and didn’t seem at all bothered to serve a table of one. I quickly ordered and enjoyed a few stolen moments of quiet to do my own thing. Soon my Grilled Caesar salad arrived. It was no more or less exciting than I expected, but it was totally good, and I immediately felt better about lunch. 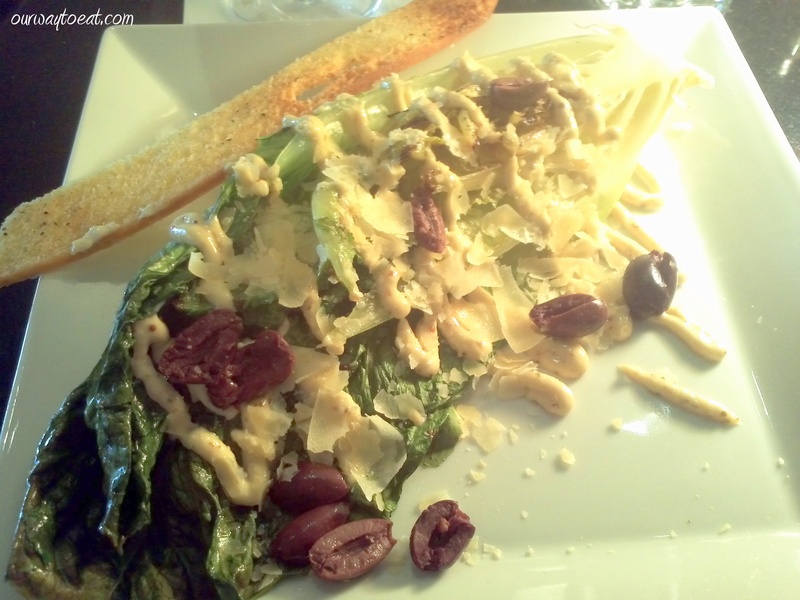 I have noticed that nicer Italian restaurants are now grilling a head of romaine lettuce, and serving it whole in a deconstructed Caesar salad, rather than chopped or torn, with all elements combined. Nowadays, said Caesar salad is probably going to arrive with either a whole anchovy, perhaps some chopped kalamata olives or some crunchy, lacy, toasted Parmesan cheese and an artistic crouton somewhere on the plate. 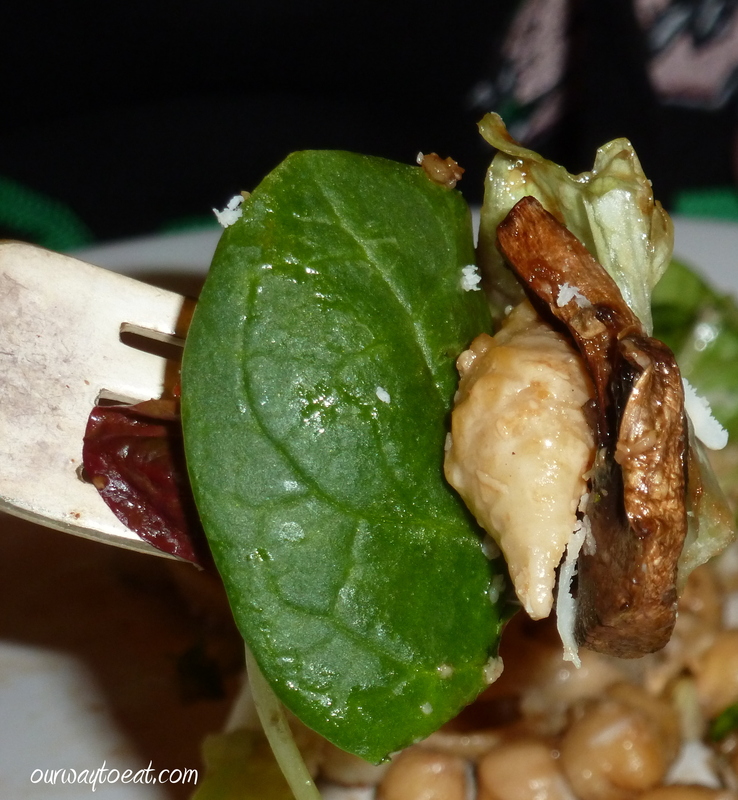 Maybe grilled romaine is standard everywhere else, but, it is my position that it is a newer offering in Minnesota. I surmise that serving the lettuce grilled and the salad deconstructed challenges diners and adds enough interesting possibilities for presentation and accoutrements to allow the chef to keep the ubiquitous Caesar salad on the menu without feeling like they’ve given up on their dreams. 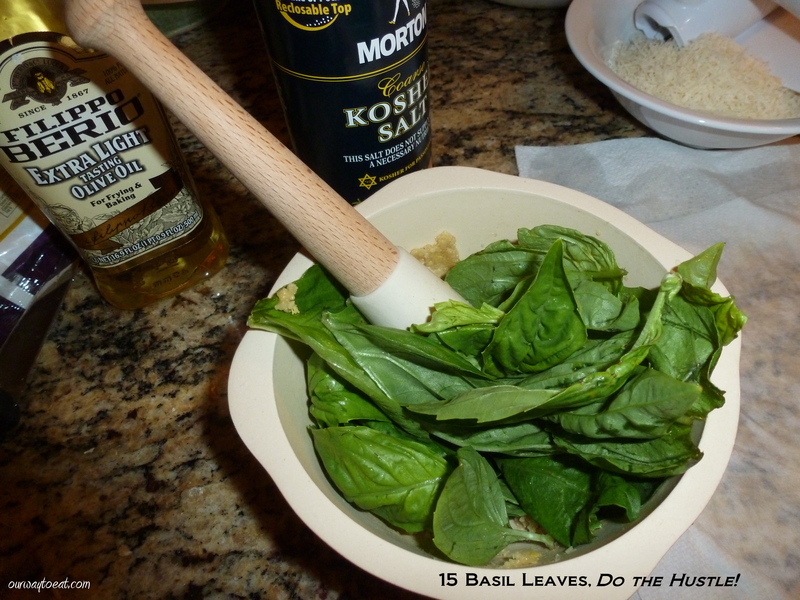 Basil’s and the grilled Caesar are both trying to be fresh. The grilled salad did so more convincingly than the aging power-lunch spot — an out-of-step microcosm in the surreal universe of the IDS Center — where silver-haired suits hesitantly broker the passage of a torch forged of intensely-burned midnight-oil during long absences from home in the western ‘burbs to smartly be-spectacled nouveau-yuppies in short trousers and argyle socks poised to board a bicycle bound for South Minne at 5:01 p.m. Me? I just wandered here looking for a salad and to seize a minute to write in the middle of a downtown workday. I have been eating and making stir fries all of my life. Stir-frying vegetables and a protein of choice served with rice or noodles is a weeknight staple in so many homes. It is easy and flexible in that you can use whatever vegetables you have. It is also satisfying and can be quite healthy if you aren’t heavy-handed with oil in the preparation. I consider myself to be fairly adept at stir-frying vegetables to tender-crisp, but my challenge has been developing a tasty and full flavored sauce. I don’t buy stir-fry sauces, and in experimenting with the ingredients and seasonings used to develop flavor, I have served some meals in which the flavor was weak. After many trials and much error I took some guidance from others [here and here]. 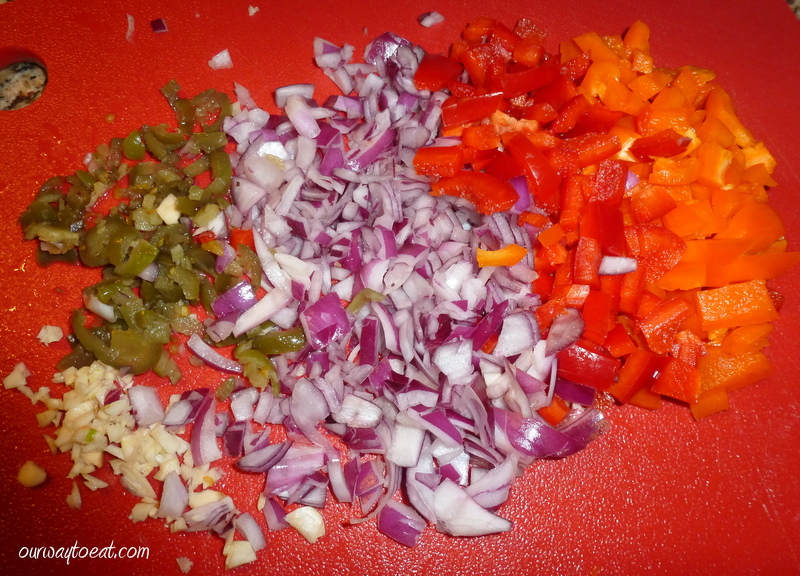 Now, I am finally cracking the code of making tasty stir-fry sauces from scratch that are simple and flavorful. 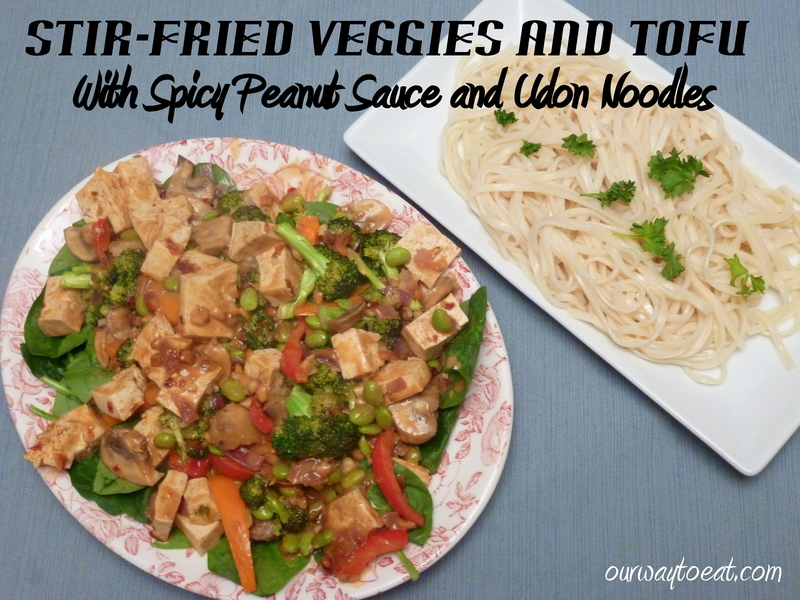 Tonight’s Stir-fried Vegetables and Tofu with Udon Noodles in a Spicy Peanut sauce was declared a winner. 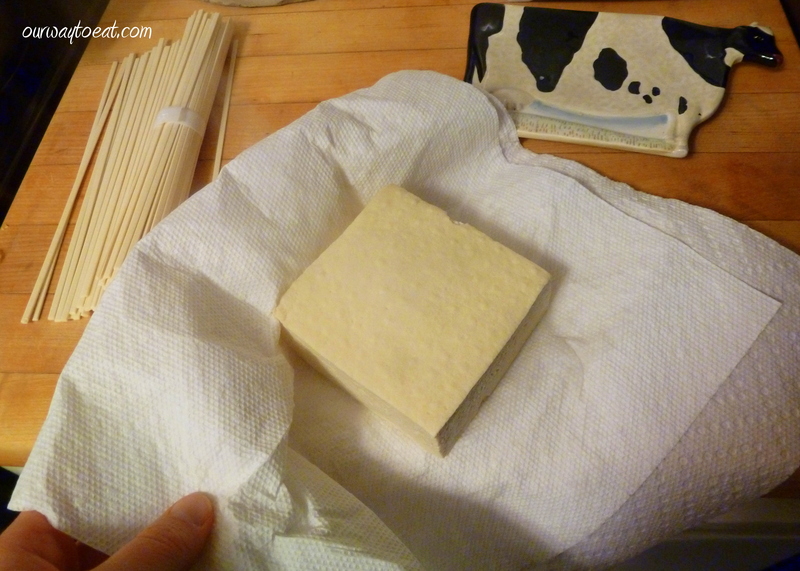 1 block of Extra Firm Tofu, with excess water removed then cut into cubes. Meat eaters might enjoy chicken, beef or pork instead of tofu, either pre-cooked, or sautéed with onions and other seasonings before vegetables are stir-fried. 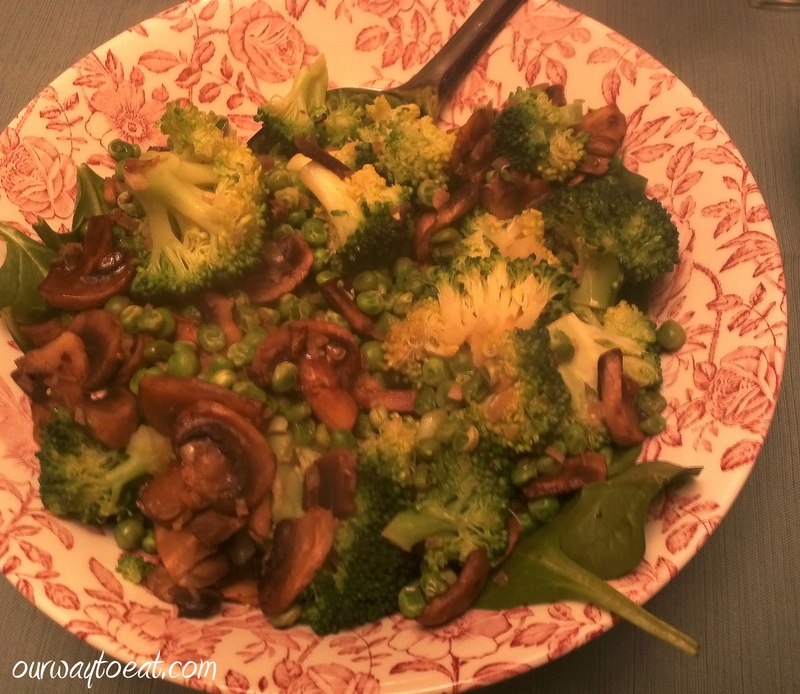 There are no limits on the vegetables that would be great in this Stir Fry. Other vegetables that come to mind include cauliflower, shitake or cremini mushrooms, green peas, green onions, water chestnuts, baby corn, bamboo shoots, carrots, celery, bok choy, cabbage, asparagus, snow peas, broccolini and green beans… It will be great with just about any vegetable you like. You simply assemble an assortment of vegetables, wash them, and then chop them into nice, bite-size pieces. This is a meal that comes together quickly once you start cooking it, so I like to get all of the vegetables ready and make the sauce before I even start stir-frying the vegetables. 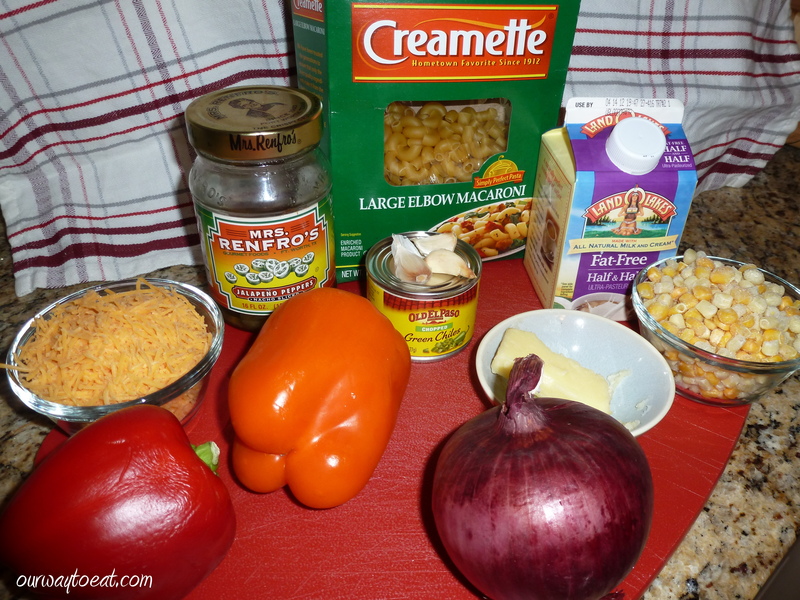 I whisked together the following ingredients into a spicy-peanutty sauce. You can adjust the heat up or down according to your preference by adding additional Red Chili Flakes or Garlic-Chili paste. My sauce was fairly spicy to begin with, so I decided simply to stick to my original recipe. I placed a bottle of Rooster Sauce on the table in case either of us found the spice level to be lacking. 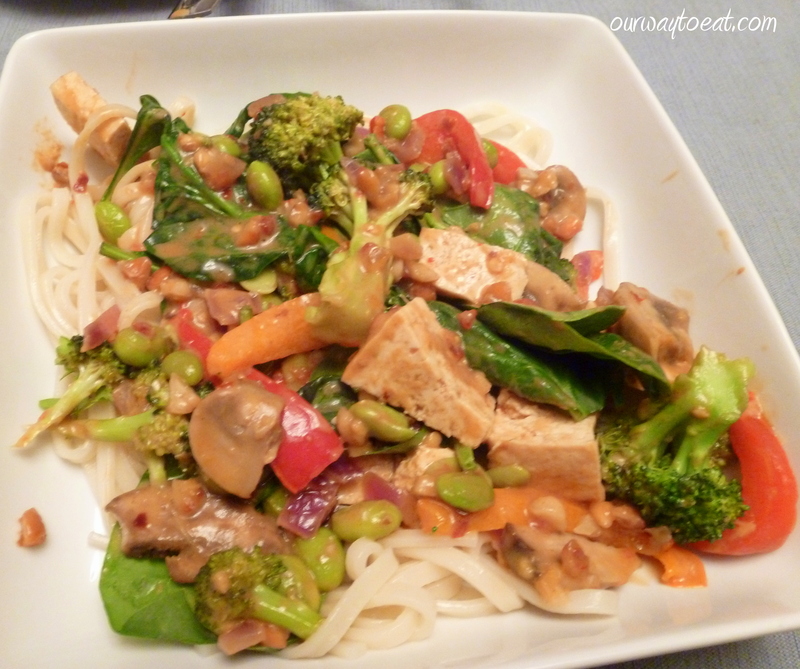 Once the Spicy Peanut Sauce was ready and all of the veggies were chopped, I selected Japanese udon noodles from the pantry to serve with the stir-fried vegetables. I like udon noodles quite a bit. 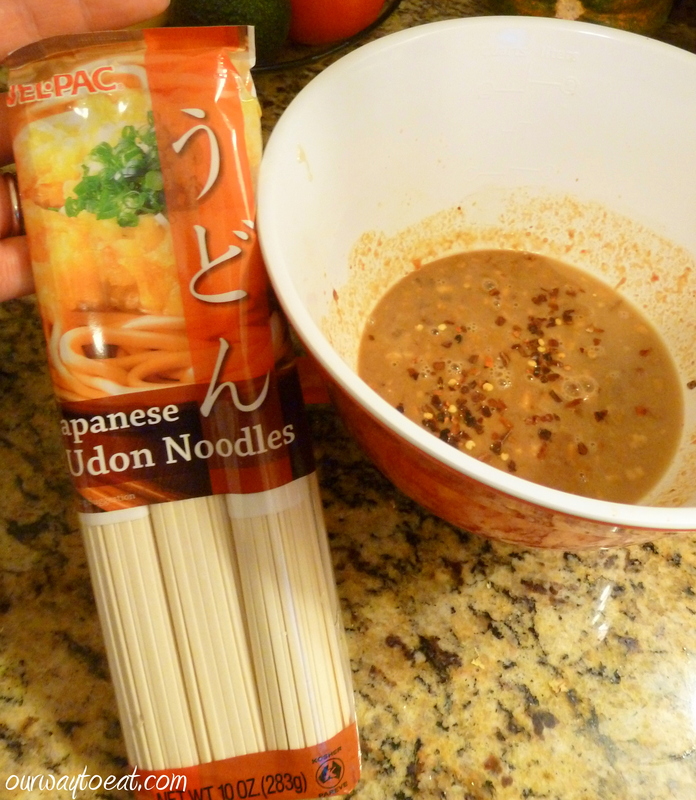 Even though udon have a light colour, they are a whole wheat noodle. They have a smooth texture and a similar size to linguine. Instead of udon noodles we often have nutty buckwheat soba noodles, rice noodles, regular whole grain spaghetti or occasionally rice. I have noticed that udon noodles are salty enough without additional salt added to the water as you would add to most pastas. I like the way udon noodles come wrapped in individual portions. I typically make way too much pasta, and we have leftovers for days. The guidance helps. 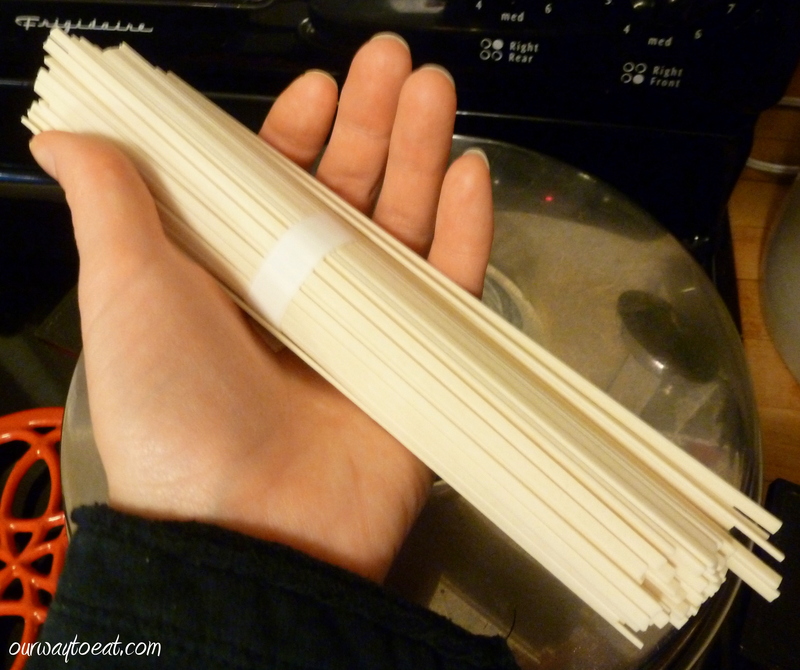 Let me let you in on a nifty trick for preparing tofu to be cooked. When you purchase tofu packaged in water, you need to squeeze out some of the liquid so that the tofu can absorb the sauce and flavor of the vegetables. Rather than pressing tofu between plates and setting it precariously under a heavy object, which always wants to tip off and fall on my foot, someone once told me to wrap the tofu in a paper towel or a clean kitchen towel and microwave it for 2 minutes. * This process works wonderfully to remove the excess liquid from the tofu and makes it ready to absorb a flavorful sauce after being nuked on high for two minutes for 2 or three rounds. This is far easier and less dangerous for my feet. After microwaving the tofu and slicing it into bite sized cubes I started my veggies. 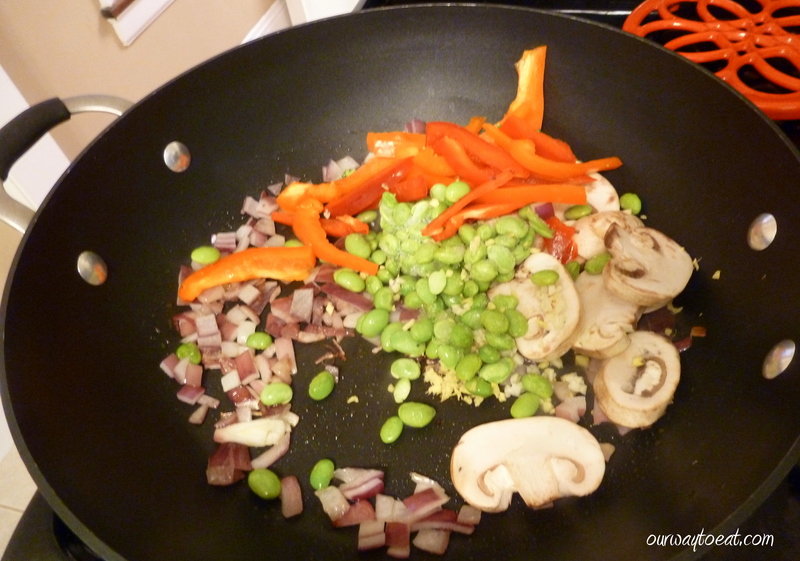 Other than a great sauce, the key to a good stir-fry is not to overcook the vegetables. I always start with onion, giving it a 2-3 minute head start in the pan with a small glug of oil before adding anything else. I use a large, deep nonstick pan, because I don’t have a wok. A wok or a well-seasoned cast-iron pan are very helpful to making a healthy stir-fry because the vegetables don’t stick, even if you only use a little oil. Next, I add the remaining vegetables in the order that allows everything to finish cooking at the same time without overcooking any single ingredient. If I was using carrots and celery, for example, I’d add them first, and cauliflower soon after, followed by frozen vegetables, and finishing with mushrooms, bell peppers and anything that takes only a few minutes to cook. 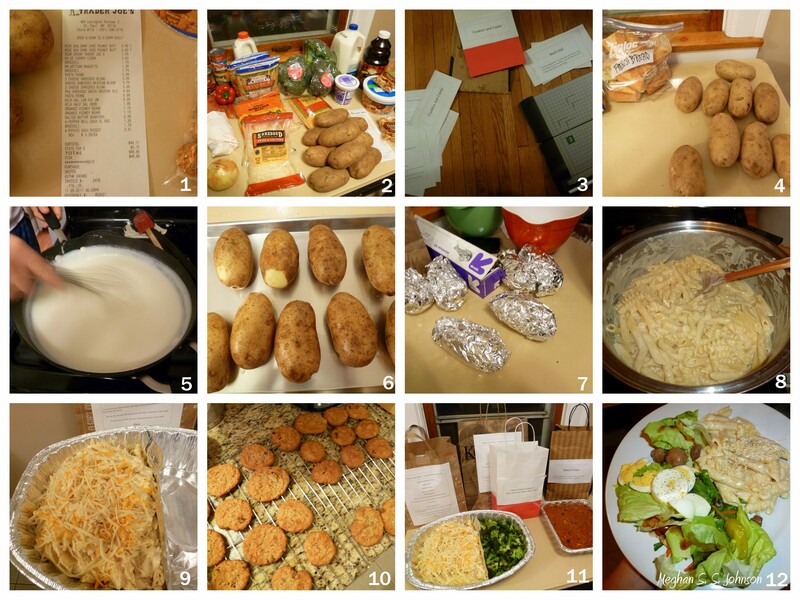 You can probably look up estimated cooking times for vegetables in a cookbook or on the internet. I have learned through trial and error. Tonight, I was able to add most of the vegetables at the same time, reserving the broccoli, tofu and spinach to add later, since they need a shorter cooking time. 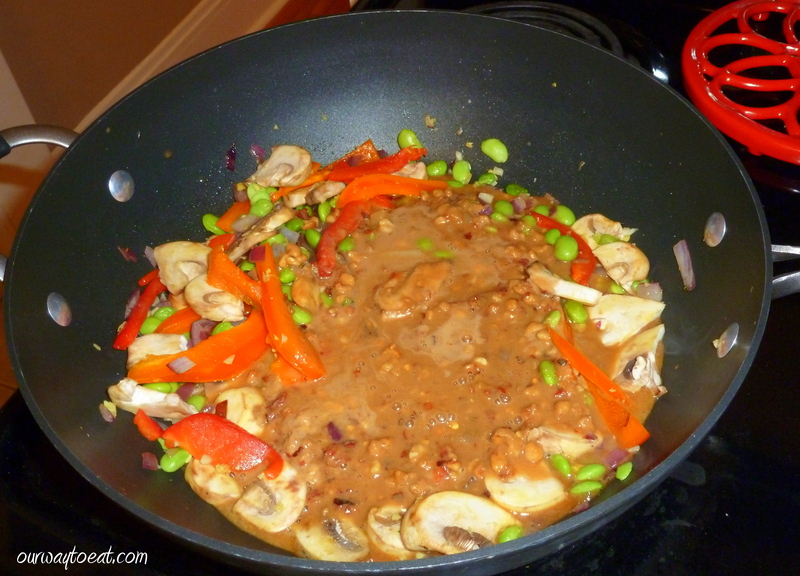 When the veggies had cooked about 2 minutes and were looking bright and well on their way to tender-crisp, I added the peanut sauce, turned the heat to low and let the whole thing cook for 4 minutes. A few minutes with heat allows the salty-spicy-sweet-citrusy-nutty elements of the sauce to meld. 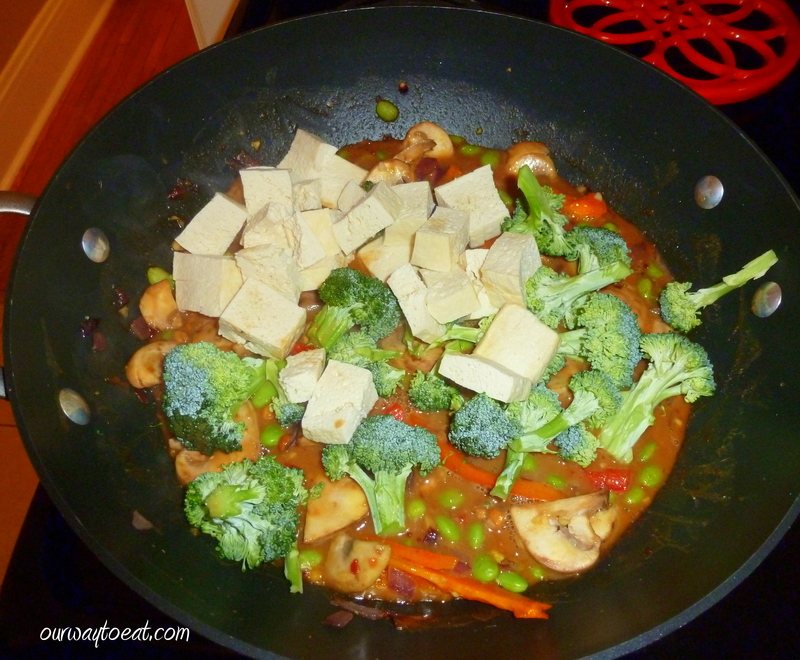 When I figured the vegetables and sauce needed another 4 minutes more to cook, I added the broccoli and tofu. Even though broccoli is a dense, cruciferous vegetable, it cooks quickly, and after no more than about 4 minutes, it is done. When the vegetables are done they are bright and softened, and still retain a firm bite. Tofu is great sautéed or broiled, but tonight I wanted to eat it fresh, so I cooked it just enough time to absorb the sauce and to be heated through. 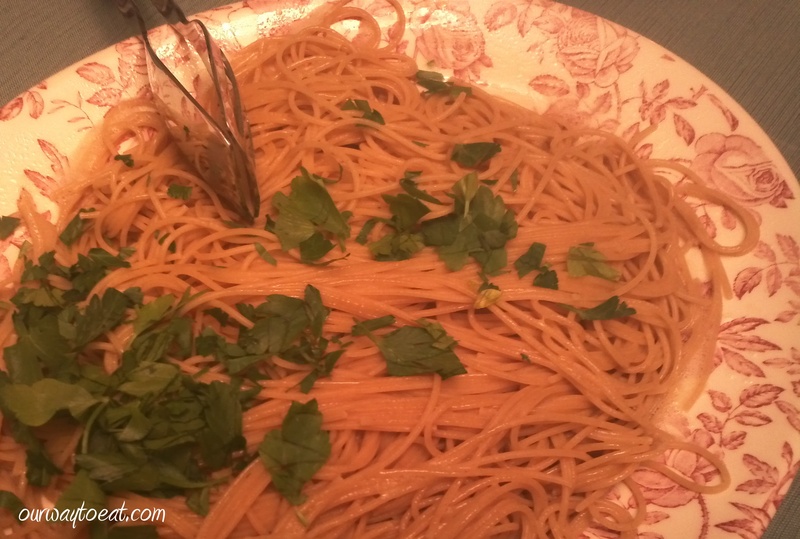 When the noodles were cooked, I drained them and served them on a small platter with a few sprigs of curly parsley. Cilantro would be a suitable garnish for the pasta, if you like cilantro, but we aren’t big fans. 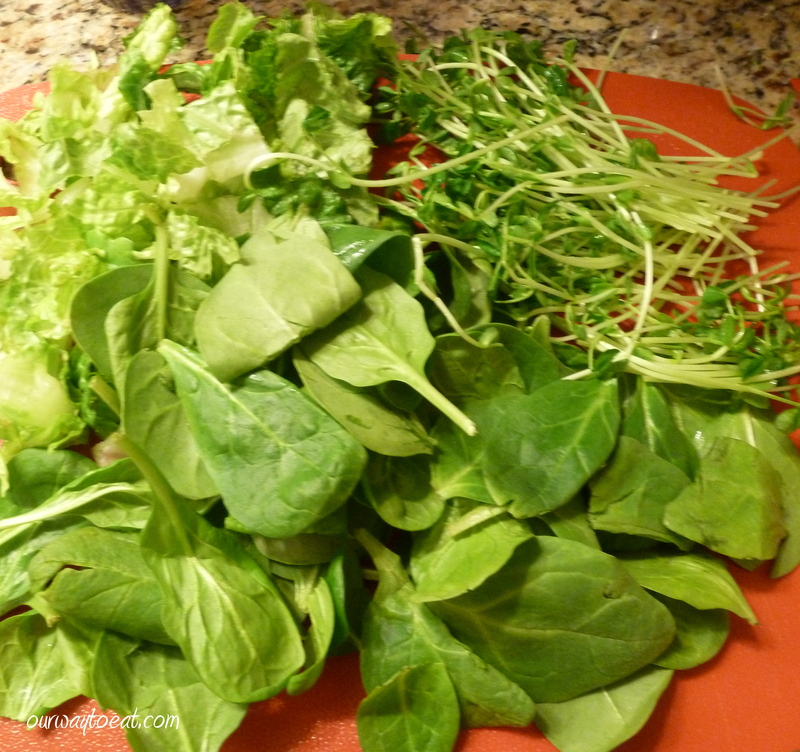 Before serving the stir-fry, I scattered the fresh spinach leaves in a pile on the platter. I could have stirred the spinach into the veggies and sauce and allowed it to wilt, but I find that spinach is great, even if it only half-wilts under a mound of steamy vegetables. We both enjoyed this stir-fry. It was full of spicy, peanutty flavor and a bright variety of vegetables that retained their bite. 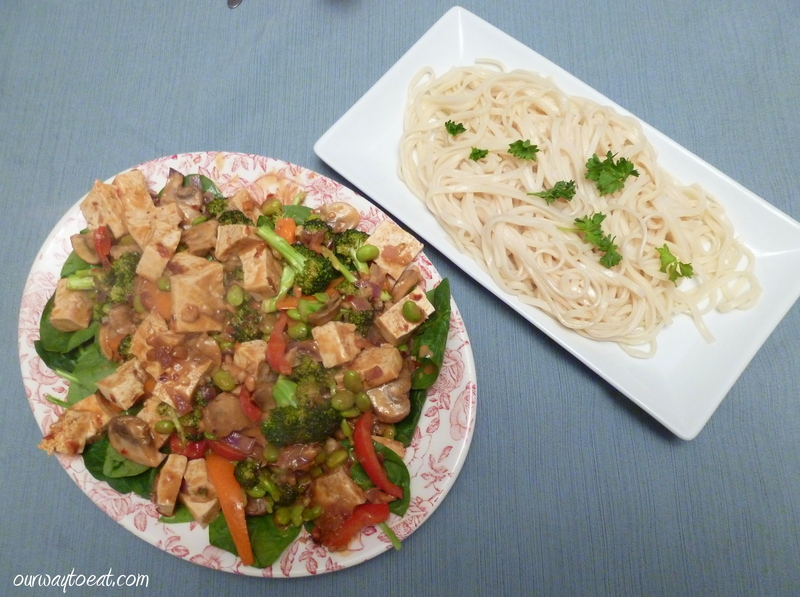 The tofu also soaked up plenty of flavor and was as easy as could be to prepare. And the pasta? Everything tastes good on a serving of steamy, al dente pasta. 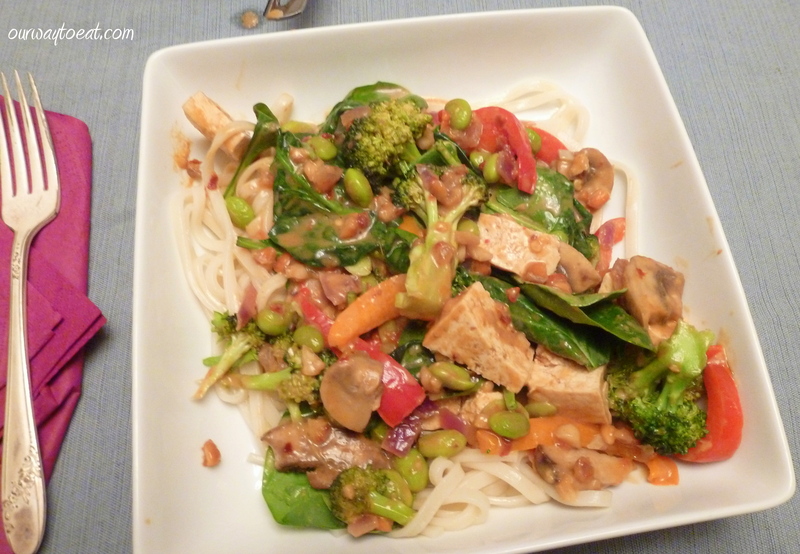 When you are in the mood for an easy and delicious vegetable stir-fry, consider trying this tasty recipe. The sauce and veggies are full of texture and flavor. This dish is flexible, quick and easy enough to make any night of the week. *Thank you to the person who told me the tofu-nuking tip, whoever you are. I am so pleased that I don’t have to press tofu ever again. My recipe takes most cues from the Pioneer Woman version. I started assembling my “cast of characters” to make sure I had enough of the main ingredients to make the recipe. 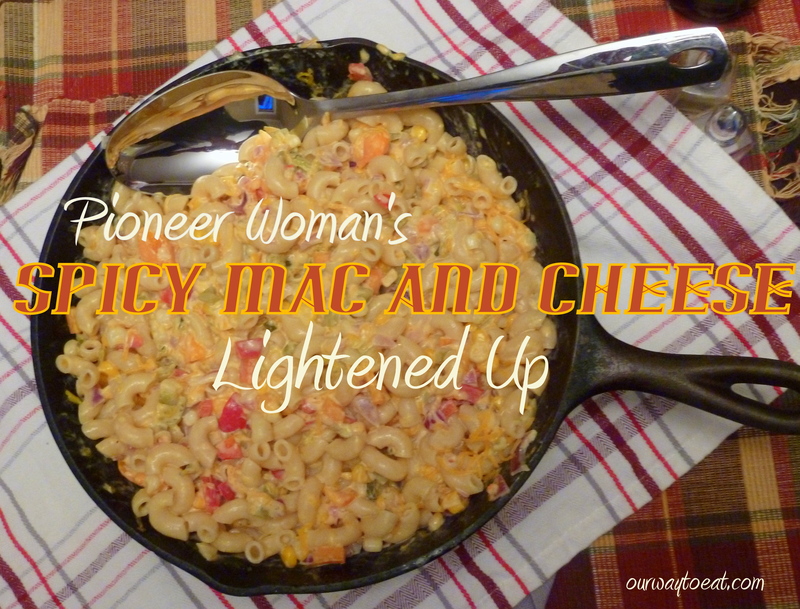 If you are up for using 2 Tablespoons of Butter and a Cup of Heavy Cream in your spicy Mac and Cheese, you can follow this link back to Pioneer Woman to follow the original recipe. I’m sure it would be over-the-top delicious. I reduced the butter, used fat-free half and half, had to substitute jalapenos from a jar for fresh, and sharp cheddar for pepper jack cheese because that was all there was in the fridge. I added orange bell pepper to the ingredient list because I had one. 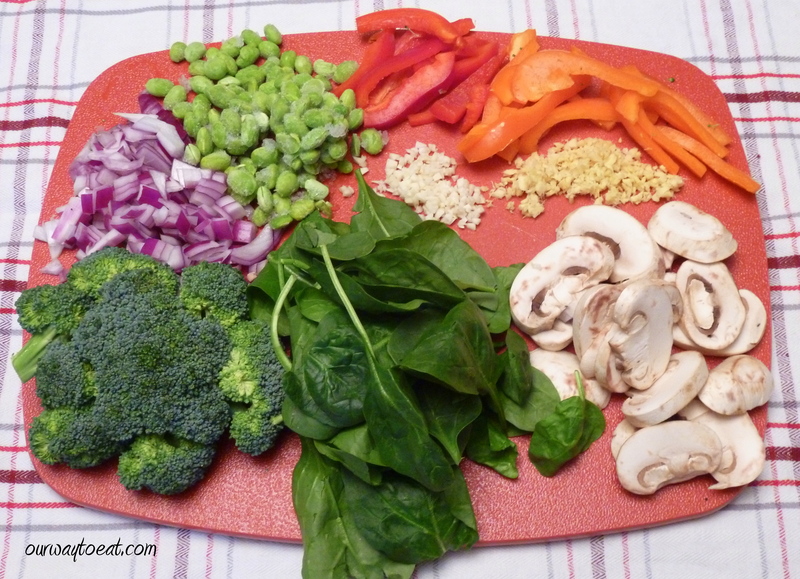 I love making my meals into a colorful, antioxidant-rich rainbow. 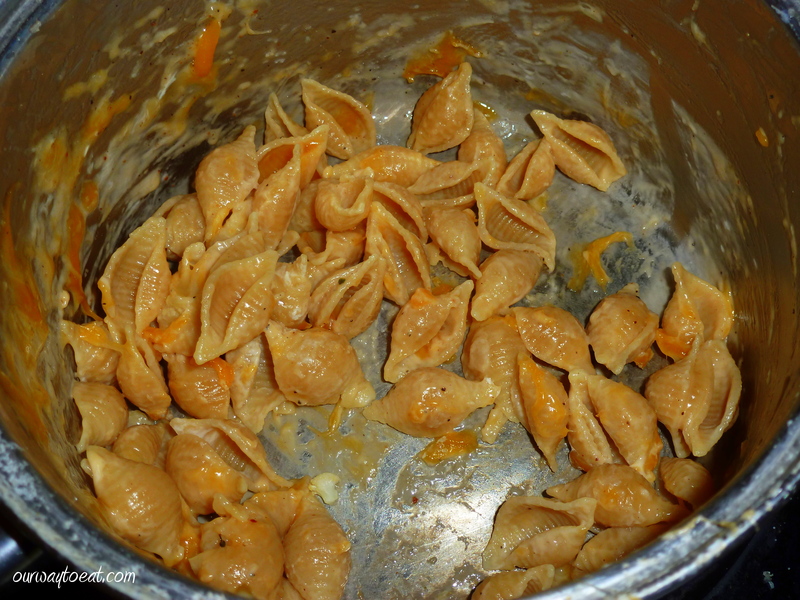 I am not going to pull any punches, my Spicy Mac wasn’t exactly “light,” but the slight adjustments brought the calorie-count down into a normal range for a serving of a satisfying size. I didn’t leave anything out that added flavor. 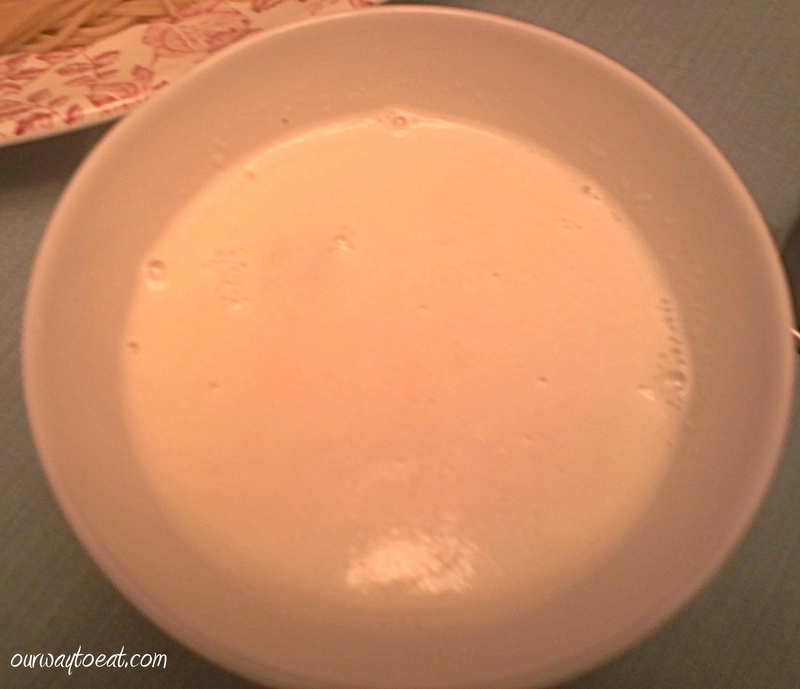 1 cup fat free half and half – I use fat free half and half because it was the only dairy we had in the fridge. Milk with a fat content of your preference, half & half or the real deal heavy cream will all work wonderfully. The entire dish took about 30 minutes, start to finish. I began by filling a sauce pan of water with a dash of salt to boil for the pasta, and heating a skillet with a small glug of olive oil over medium heat. 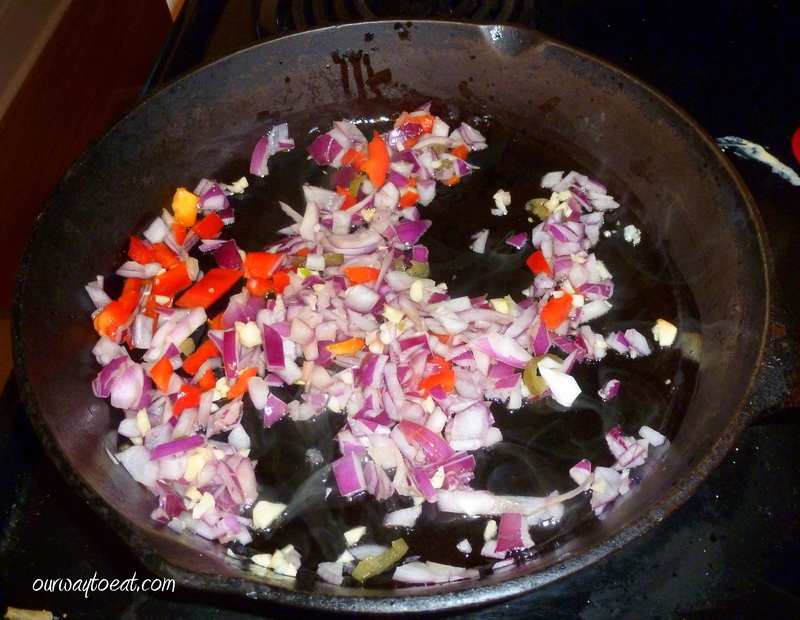 While those warmed up, I chopped the red onion, red and orange peppers into small chunks of a similar size. I chopped a few forkfuls of jalapenos from the jar. The next time I make this, I will of course try to have a fresh jalapeno, but if I don’t, I will probably use more of the jarred jalapenos. The jalapeno adds most of the heat, and quantities can be adjusted up or down depending on your spice tolerance. 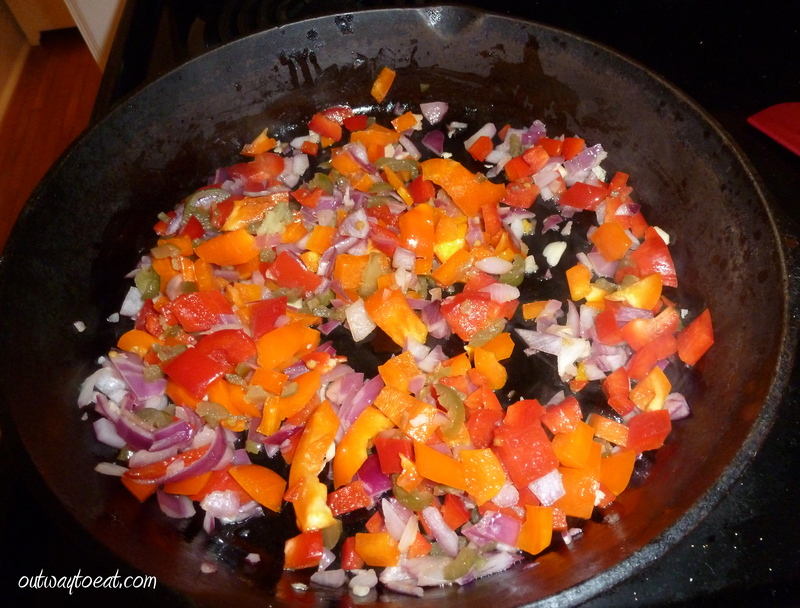 I sautéed the onion and garlic a few minutes before adding the bell pepper. At the same time, I started boiling the noodles to a little less than “done” so they could cook a little more in the sauce to become al dente. 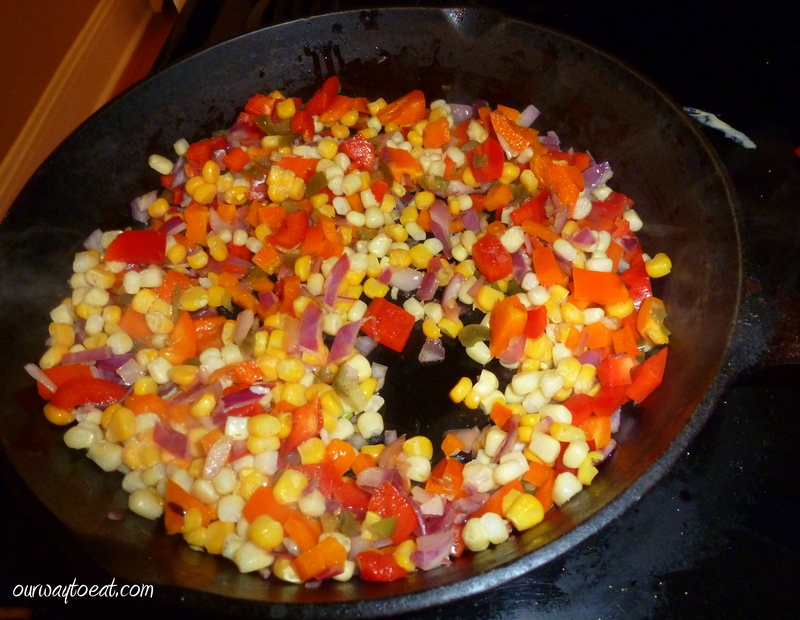 When the onions, bell peppers, garlic and jalapenos were bright and heading toward tender-crisp, I added a heaped cup of frozen corn. 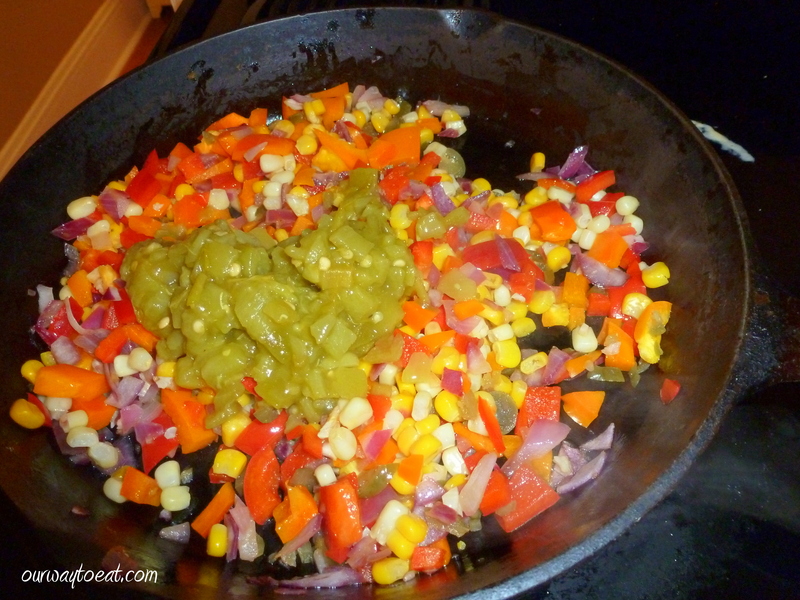 When the veggies were cooking, but still had crunch, I added a can of diced green chilis. Diced green chilies have become a pantry staple in our house. They are mild and they add a smoky complexity to Southwest and Mexican soups and stews without too much heat. 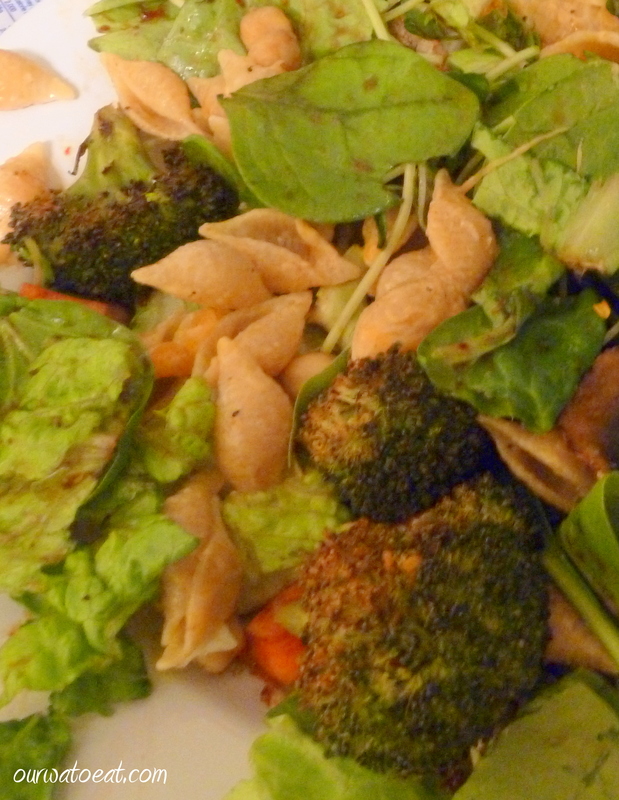 When the veggies were nearly done, I turned off the heat in the skillet, and drained the pasta. The sauce is extremely simple, which is a plus. This is the perfect macaroni and cheese to make when you don’t have the time, or the desire to monkey around making a roux. 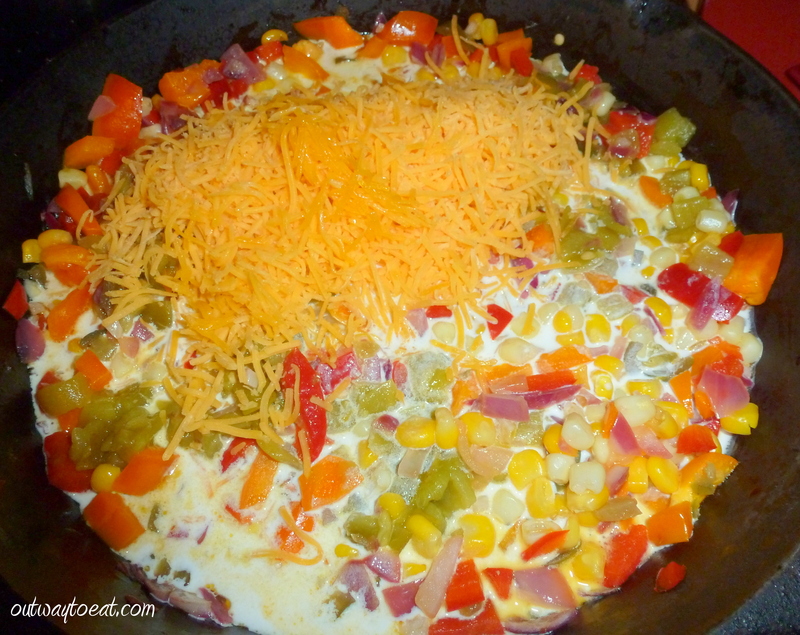 I simply added the fat free half and half and cheese to the skillet and stirred it gently into the vegetables. A skillet retains heat for a long time, so it was warm enough to warm the “cream” and melt the cheese. Finally, I added the pasta to the skillet. 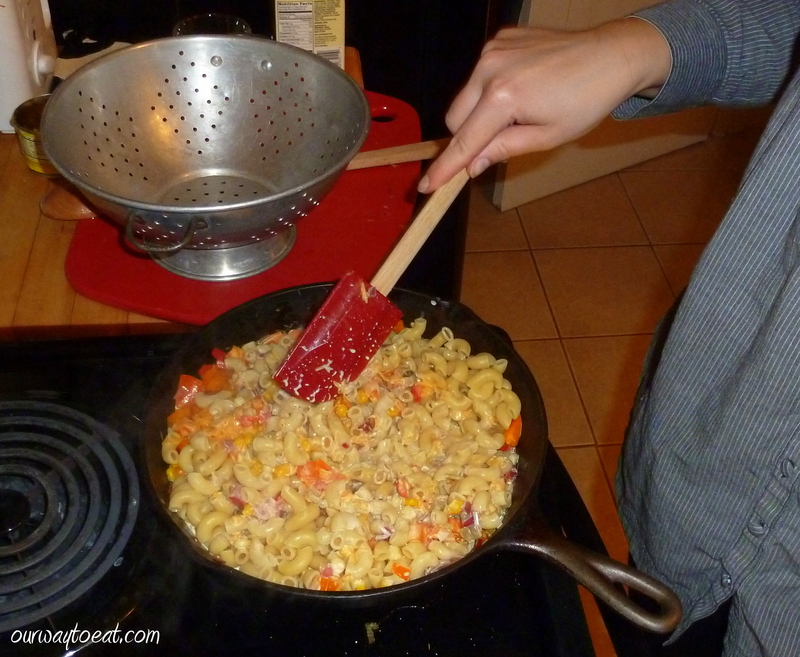 I stirred gently to combine the pasta, veggies and sauce in the skillet. Per Ree’s advice, I added a little extra cheese to thicken the sauce a bit. Instead of the two pats of butter from the original recipe, I stirred in just the tiniest bit of butter. You could totally leave the butter out and you probably wouldn’t miss it, even though the silkiness it adds to the sauce is quite nice. 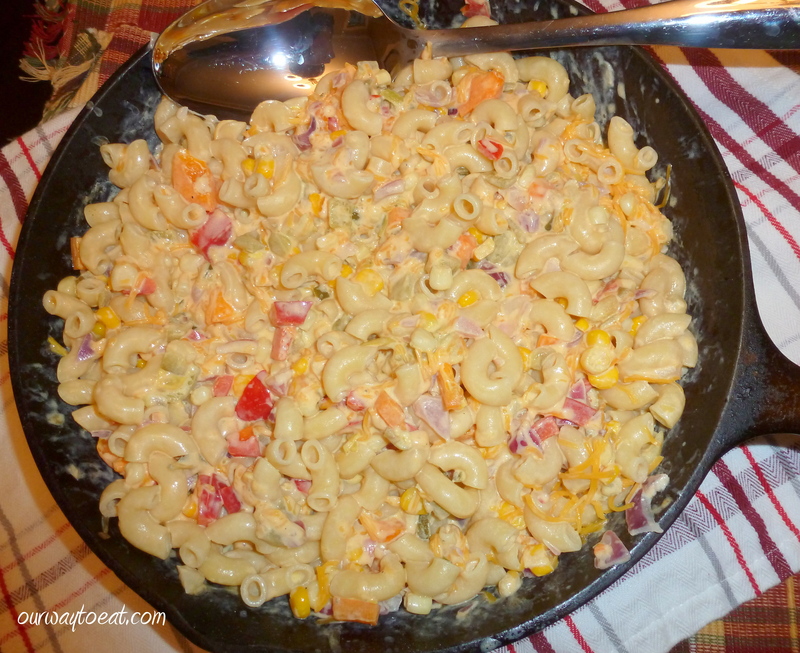 Channeling Pioneer Woman, I served the Spicy Mac right from the skillet, frontier style. 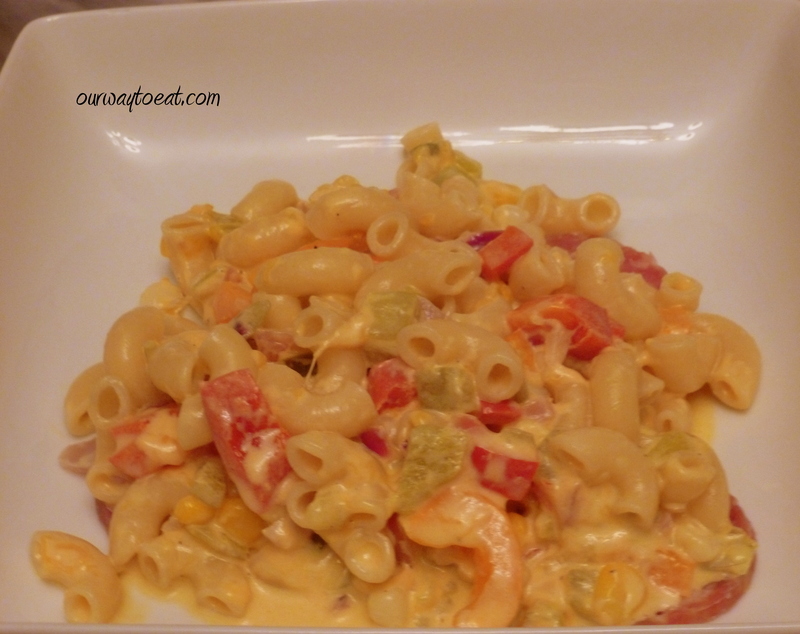 We enjoyed the rainbow of veggies, the warming spiciness and of course, the cheesy, comforting macaroni noodles. Ah, we’re home. When I make this again, I would probably up the spice a notch or two… something red, a little Smoked Paprika, Cayenne Pepper, Chili Powder or Chili Flakes, perhaps? The Spicy Mac also passed the lunch test. We both enjoyed a second serving with a small salad for lunch the next day. Ree Drummond suggests this as a dish to be served alongside a juicy steak. I might just do that the next time I need a meatless dish when my pardner is grilling steak. We both thought this Mac & Cheese stood well all alone. I recommend serving it alone with salt and pepper on the table and a cold beer, or a tall glass of milk. *I like to welcome myself home with Mac & Cheese, I also like to eat Mac & Cheese when I’m dining alone, when we have something to celebrate, on a rainy day, and for no reason at all. If you’ve been here before you will note that Mac & Cheese in all forms is my favorite. 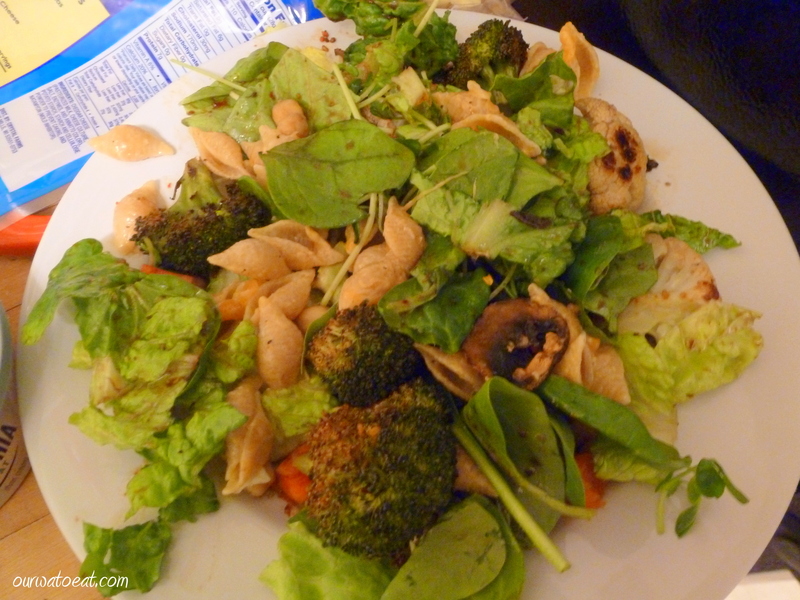 A bunch of veggies roasted, steamed or sautéed and served with some type of pasta is a meal we eat every week. Sometimes we eat it on multiple days. It is easy, and it can be absolutely yummy and healthy, if its made it right. There are infinite variations, and every time we make this we both think it is pretty great. We keep vegetables on hand, both fresh and frozen. We almost universally have mushrooms of some type, fresh spinach and broccoli in the fridge. We keep them on hand because they are wholesome and extremely versatile, but even more importantly, because I really love these veggies. I can’t imagine what I’d eat during a week that I do not eat mushrooms and broccoli. Frozen peas make a frequent appearance on our plates too. There are a few short months in the year where we might have fresh, home grown and farmer’s market peas, but the rest of the year, frozen peas are quick to make and taste great. I am partial to fresh spinach. A huge bag of washed spinach is cheaper than lettuce. You can add a few handfuls to soup, pasta, quinoa, or even a packaged frozen entrée, if you eat them. Spinach adds calcium, antioxidants, flavor and if the food is warm, it cooks in a few minutes after you add it. I am not a big fan of frozen bricks of pre-cooked spinach. I think they might be the reason spinach got such a bad rap. 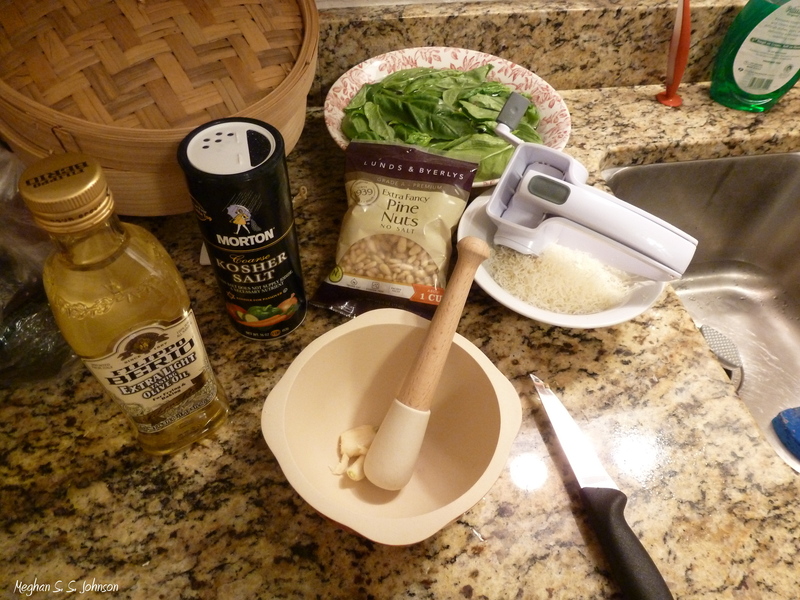 It works fine for spinach dip, but it is otherwise, too dark and mushy for me. The first key to a pasta meal being a healthy, lovely meal is veggies. Veggies! Vegetables are the absolute most powerful tool to healthful eating. They fill you up and they are full of good things like calcium, potassium, antioxidants and fiber with a very low-calorie count. The key is to try every veggie you can, get them fresh from a good source, or preserved in a wholesome manner, make sure they are prepared in a way that doesn’t ruin them and pile them on 3/4 of your plate. I love vegetables, which makes this easy. If you don’t, just try them, one at a time. Make a lot of the ones you like, and give the rest a chance. They are an acquired taste, but they are satisfying when they are the center of your meal. Tonight I sautéed garlic and a diced shallot in a little olive oil, then added mushrooms. 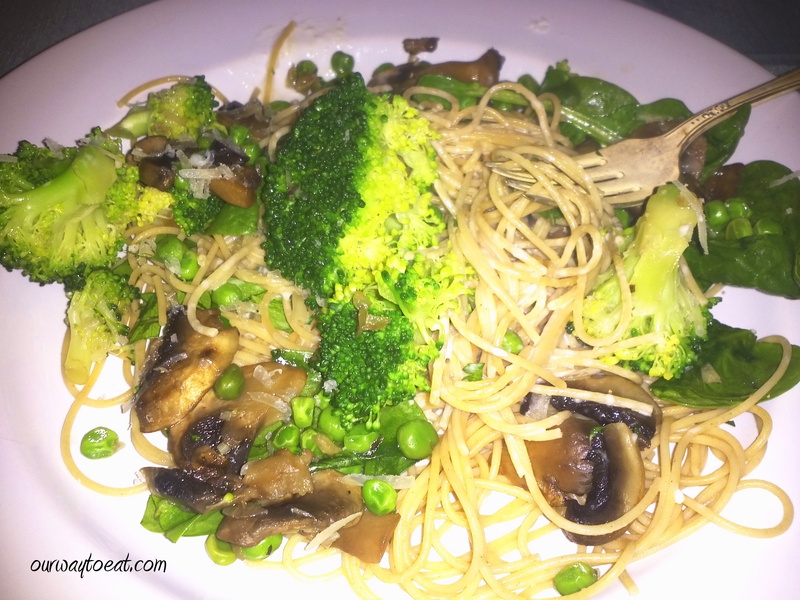 When the mushrooms began to brown, I added a splash of pasta water, and then covered to pan to allow the broccoli and peas to steam. I didn’t cook the spinach at all. 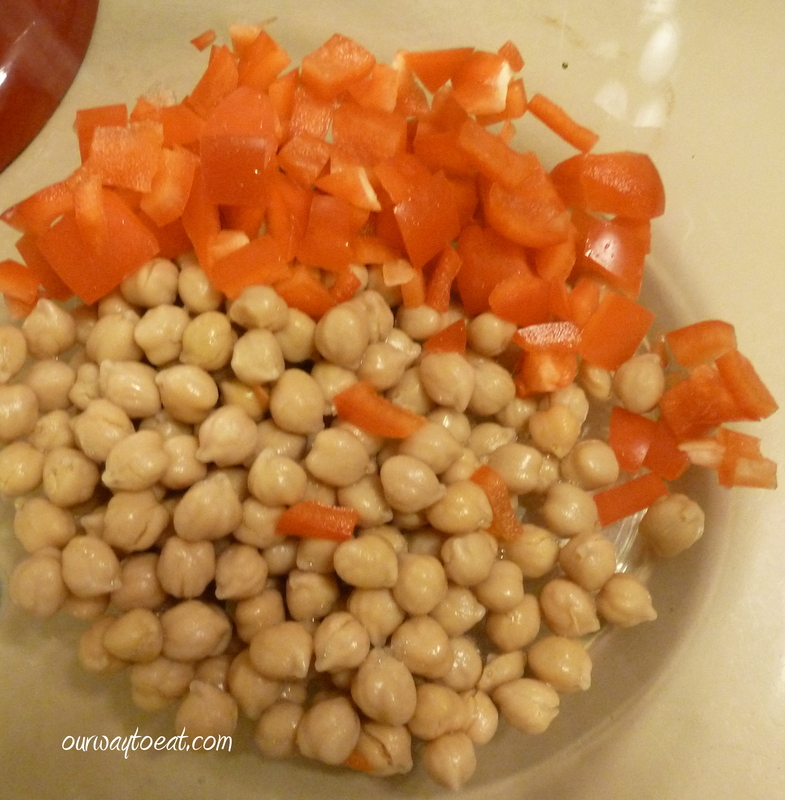 I placed two large handfuls into the bottom of the bowl I used to serve the veggies. When I added the veggies, the spinach wilted, but didn’t totally lose its shape or get soggy. I frequently roast veggies, and recently, I’ve also been steaming them in my Mom’s Bamboo steamer that she has had since the 1970’s. The entire key to veggies is not to overcook them to use a light touch with oil, salt or other seasonings. They don’t need it. The next step to making this meal, of course, is the pasta. I make homemade pasta, and I have yet to post about it. It is delicious, but I’ll admit, I like to eat pasta a little more often than I have time to mix it and roll it out. I consider it to be a process to go through for a special occasion. Tonight, we had organic, whole grain angel hair pasta, cooked al dente, according to package directions. If you ate whole wheat pastas a few years ago and found it dry, grainy and generally too serious, you should try them again. 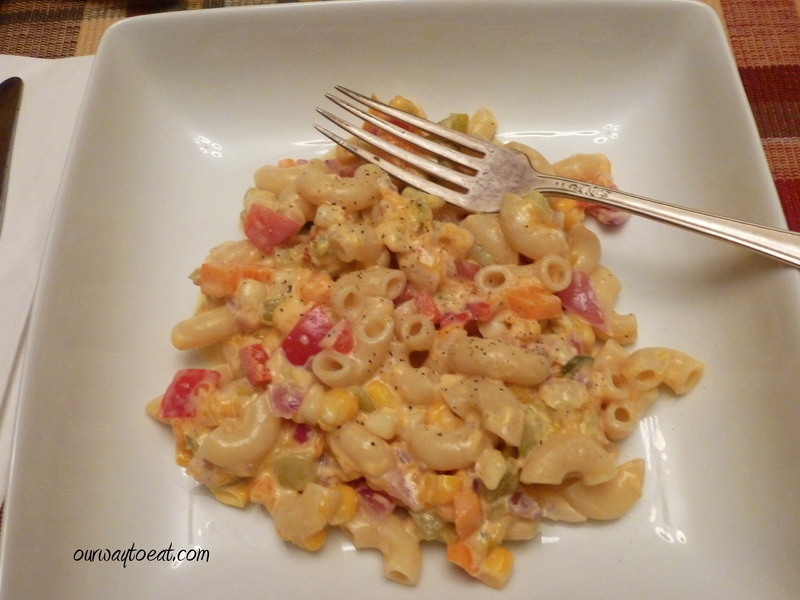 There are whole grain pastas that have a delicious nutty texture, there are even some whole grain pastas that have no noticeable difference from traditional “white” pasta. Using whole grain adds a little stomach-filling fiber, lowers the glycemic index of your meal and helps nudge a week-night pasta meal in the direction of health. Also worth noting are fresh herbs. In the middle of winter, a big bunch of flat leaf parsley costs less than $2 at our grocery store. In the summer, we grow herbs, and buy them at the Farmer’s Market for pocket change. The addition of chopped herbs to pasta is unbelievable. Your eyes will thank you. Your tastebuds will thank you. Fresh herbs elevate a dish and only add good. One out of two of us eats meat. I’ve said it before, and I’ll say it again: it is a good thing for Bjorn that he is a flexible meat eater. It makes it easier for me that he doesn’t expect meat to be a central part of every meal. I enjoy preparing meat for a special occasion and Bjorn makes it whenever he wants it, and he swears he gets enough. There are many meat eaters who don’t feel like they’ve had a meal if meat isn’t center stage. I think we’ve all gotten the memo advising us that people aren’t supposed to eat as much meat as we did before we knew where our next meal was coming from, or we needed to fuel ourselves through 12 hours of hard physical labor. Reframing meat as a dish that you have for a special occasion opens up a world of opportunity for meat to be a meaningful garnish. Here enters Soppressata. 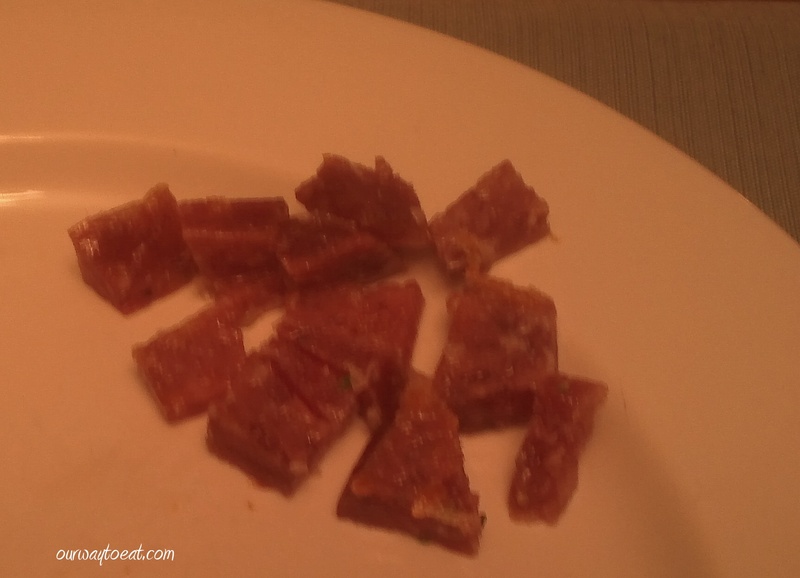 It is a flavorful hard salami. Just a few slices, casing removed, cut into little chunks and heated briefly puts a tasty bit of meat on the omnivore’s plate and rounds out their meal. Finally, there is sauce. We don’t always have sauce with our pasta and veggies. I like to use spaghetti sauce, or a can of San Marzano tomatoes, torn into chunks when we feel like tomatoes. If we aren’t feeling tomato-y, I would use a touch of olive oil or butter and a sprinkling of grated cheese or nothing. Tonight I made a simple creamy sauce. This isn’t an “every night” sort of thing though. We had a little heavy cream left over from the Soufflés Bjorn made for Valentine’s day and I couldn’t let it go to waste. I melted the tiniest bit of butter and added a sprinkling of flour. Once it cooked a bit, I added the cream and let it thicken before adding a bit of pepper and grated Asiago. Just like the meat, if you are going to use butter, oil or creamy sauce, if you use a light touch, you can enjoy the richness without consuming excessive calories. I want to live in a world where I can have my pasta and eat it too. I am finding that if I keep an eye on portions and make thoughtful choices about ingredients and preparation, I can enjoy my plate of pasta without feeling gluttonous or guilty. If it hasn’t already become extremely obvious, pasta is one of my all-time favorite foods. There are so many variations, from basic buttered noodles to whatever-you-have-in-the-fridge, to traditional recipes: stroganoff, Bolognese, or pasta all’Amatriciana. I’m usually a “concept cook” who has something in mind [e.g. 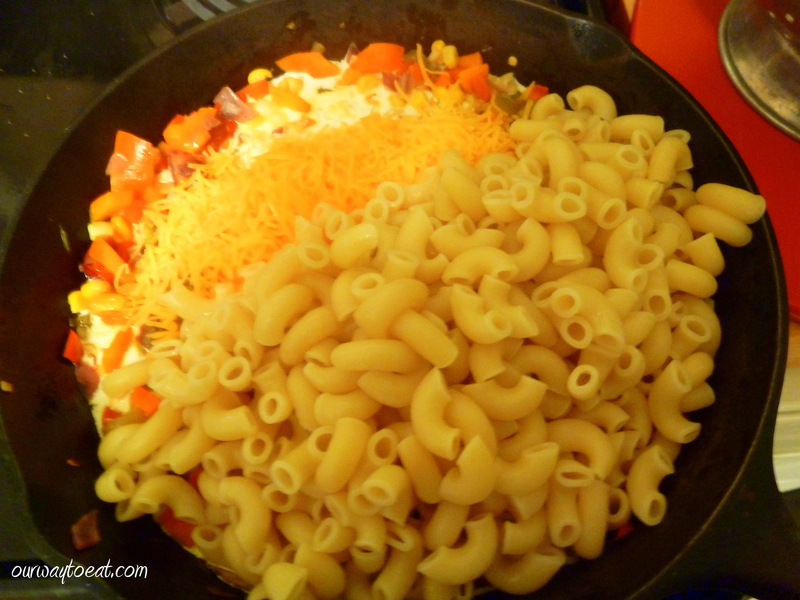 pasta with veggies] and the actual ingredients I use depend on what I’m in the mood for or what needs to be used up. I haven’t been one to follow many recipes. I enjoy the freedom of my slapdash approach to cookery, but I have tasted enough really good food in my years to know that recipes, carefully chosen ingredients, timeless techniques and even a little precision are equally as necessary in the kitchen as passion and creativity. It also pays to take a few tips from the experts. I have long loved food blogs, food magazines, food television, cookbooks and hanging out in other people’s kitchens. 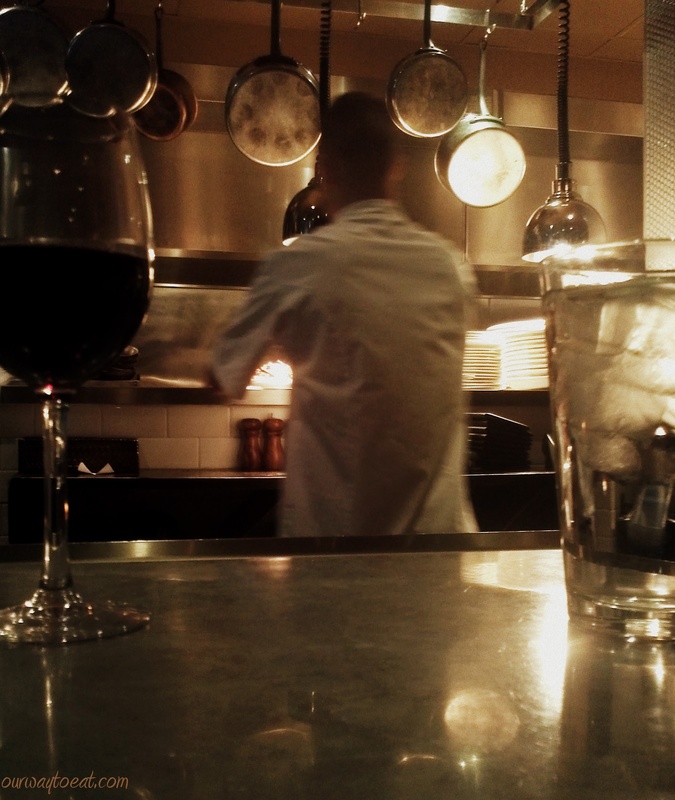 Reading about cooking, talking about it and observing other cooks in action are my source of inspiration. These are as much my hobbies as cooking and writing about food. 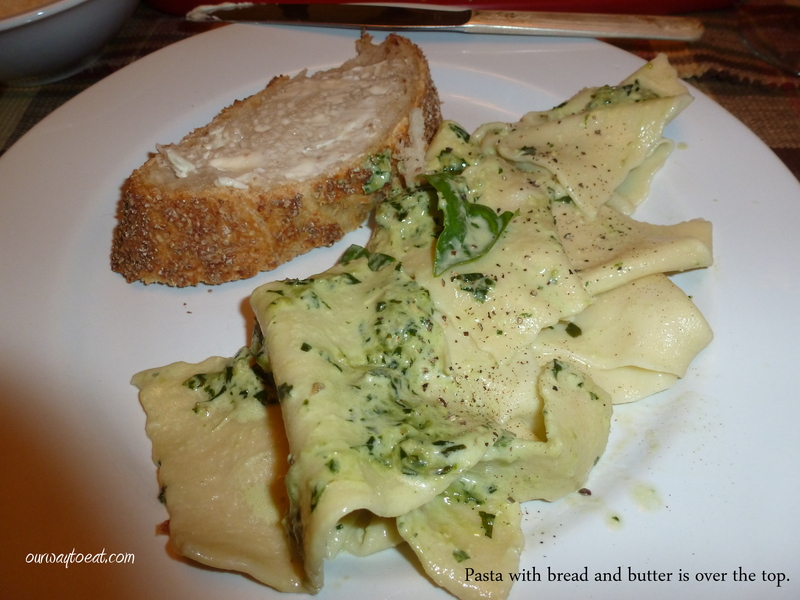 I became aware of the noticeable difference that good technique and ingredients yield in restaurant meals, but the breakthrough did not occur at home until I learned about the perfect pesto. It was just another Wednesday night. I found myself watching short programs on the Chow network on our Roku on cooking and food. There was an episode on soup dumplings,* and on the perfect beer,** and then a segment on the perfect pesto aired and changed my approach to pesto forever. Previously, I have only had a modest appreciation of pesto. The first pesto pasta I ate was a lunch back in my teenage years at the now-shuttered Grandma’s Restaurant in Fargo, North Dakota. It was so heavily garlic-y that I was afraid of both pesto and garlic for almost a decade. 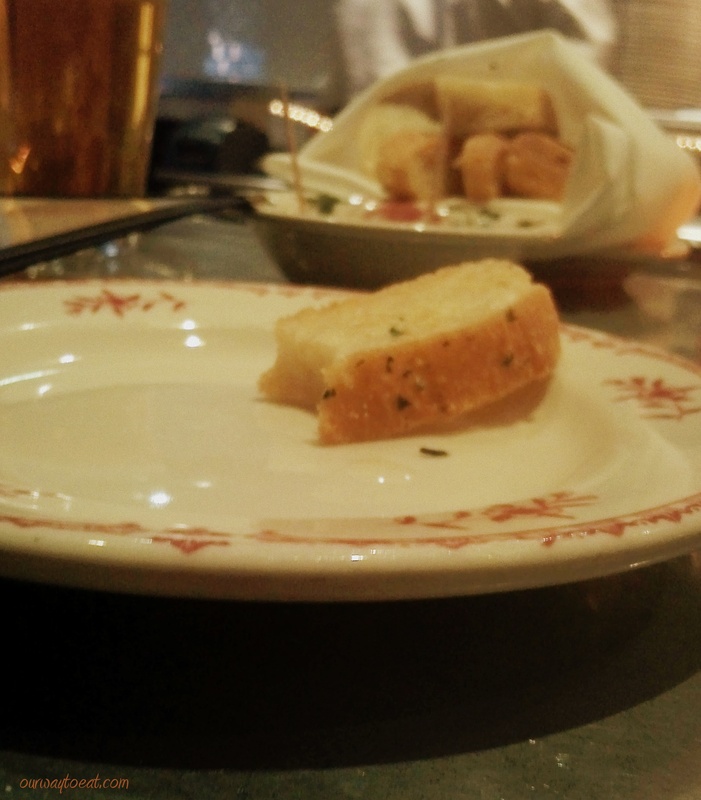 I still shudder to think about how much raw garlic I consumed before realizing it would be with me for days. 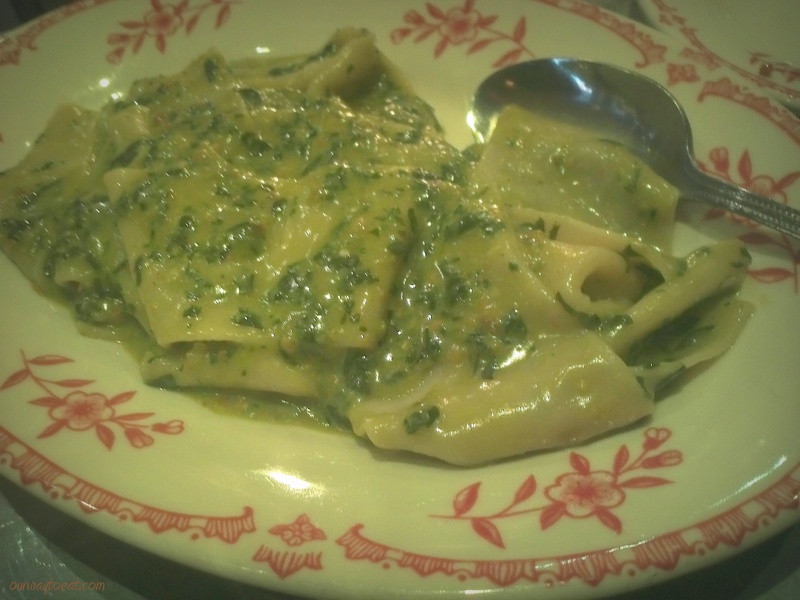 More recently, I have tasted a pretty good silk handkerchief in a mild, dark green pesto at Bar La Grassa. Having grown basil in our garden, I’ve also made basil and parsley pestos at home that have been fine on toasted sandwiches and roasted vegetables. None of these looked anything like the marvelous green pesto I saw that evening on the Chow network. Back to a winter day in Minnesota… I may never duplicate Chef Laboa’s pesto, but in listening to him, I learned a few things about how to make a better pesto. 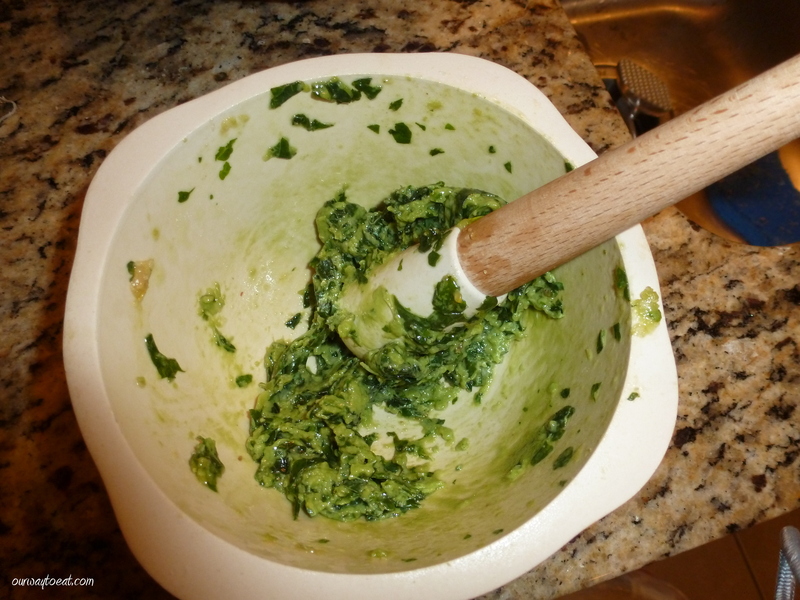 First, for a pesto worthy of freshly rolled pasta, you have to ditch the food processor and use a mortar and pestle. Fortunately for me, I just received one for Christmas from Bjorn. The one he selected for me is a nice small size that I can comfortably manage to hold. It is made of non-porous porcelain and a smooth wooden handle and a red exterior that I am happy to store on the open shelves in our kitchen. I learned from Chef Paolo that the origin of ingredients matters a lot. 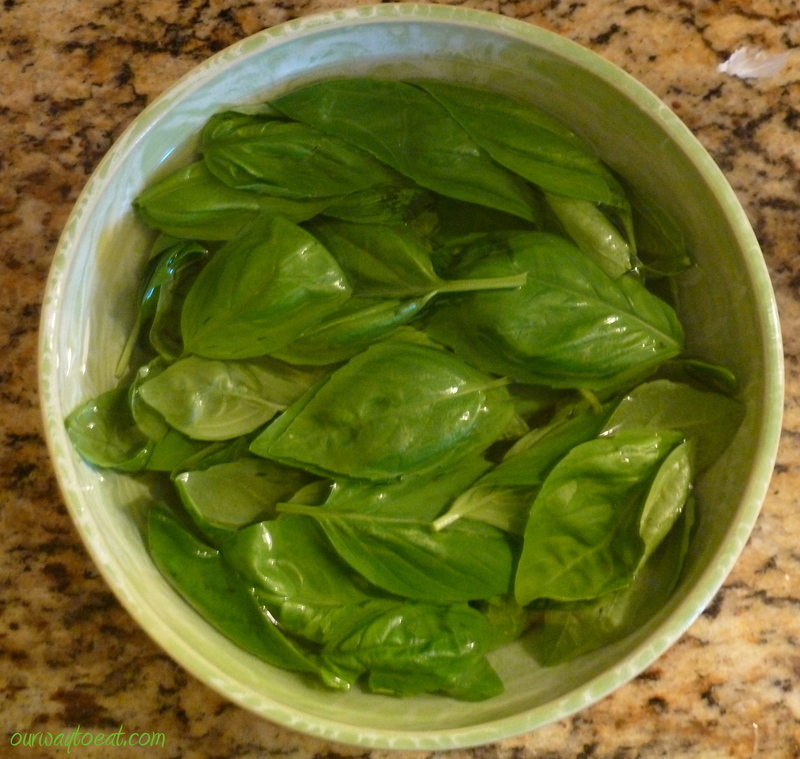 Basil pesto universally contains basil, pine nuts, garlic, olive oil, parmesan cheese and salt. Sure, you can make pesto out of these ingredients produced anywhere, but to begin to approximate Paolo Laboa’s pesto, you need basil that is similar to that grown in Genoa, Olive Oil from Liguria, Pine Nuts from Pisa, and carefully-selected Parmesan. And you need time. Lots of time. After watching the segment and trying to make it myself a few times I realized the making of Paolo’s pesto takes longer than it appears to take on TV. I did the best I could gathering ingredients. It is winter, and the basil I found at the store wasn’t the best. I do believe that the Genovese basil from our garden will be an improvement on the basil available at the supermarket in a clamshell package in January. I didn’t spring for $18 Italian Pine Nuts but got some from Spain instead. I tried a few of Chef Laboa’s tips. Since Ligurian olive oil is not available to me I used light olive oil instead of extra virgin which is too strong and kills the taste of the basil. I soaked the basil leaves in water because, I learned if you don’t soak the basil there is too much chlorophyll in the leaves. 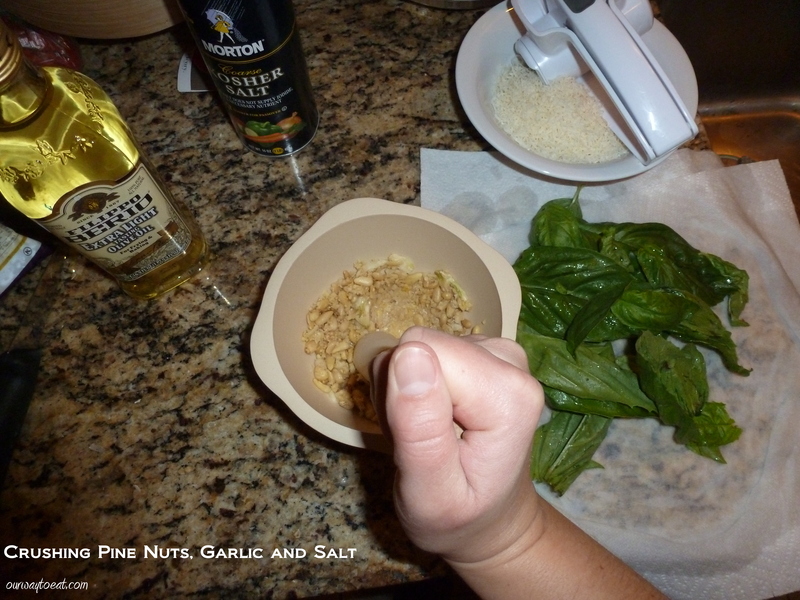 I crushed the pine nuts with garlic and coarse salt and added 15 basil leaves. I put my heart into the process of grinding all of the ingredients together and then mixing in the oil. When the pesto was ready, I added a little pasta water to the pesto to melt the cheese before tossing hand-rolled handkerchiefs of pasta in the pesto. The end result of my effort did not yield the solid bright-green cream produced by Chef Laboa. Not even close. Even so, we thought the result was delicious and immeasurably better than the oily, basil-heavy, oxidized, chunky sludge that I’ve made in the food processor. If pesto is worth making, it is worth making well. 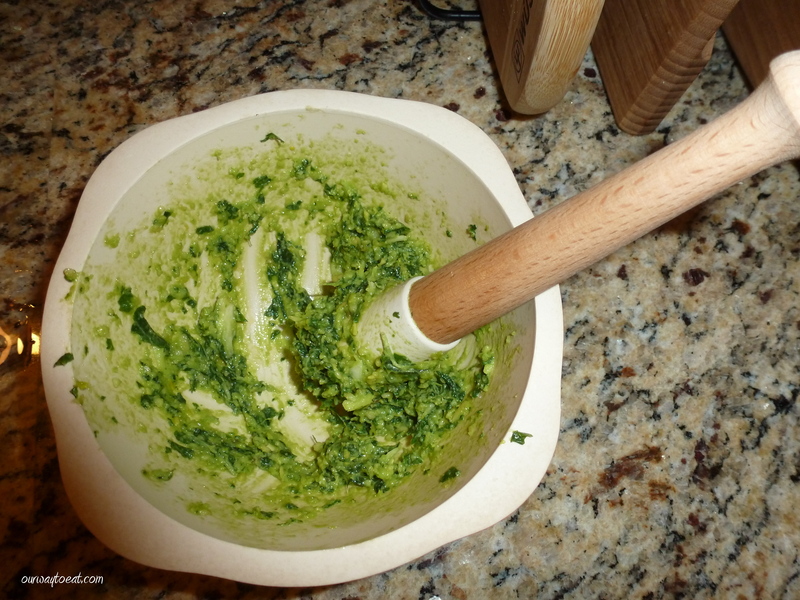 Will I spend 45 minutes with the mortar and pestle to make pesto every week? Certainly not. It is a time-consuming process and a rich dish you can’t eat every week. Come summer though, when the basil is bursting forth I will make pesto again. I might not achieve “perfect” pesto, but delicious will be good enough. *The segment about soup dumplings made me want soup dumplings which are little pouches made of dough that are stuffed with meat and fatty broth that liquefy upon cooking. Are there vegetarian soup dumplings out there? I want to try them! **The writer of the beer segment claimed Supplication Ale by Russian River Brewing Company to be the best beer in the world. I’m sure I’d like it, but that I’d disagree about it being the best. At some point this year, we turned a corner. Without any warning or fanfare, we found ourselves rested enough, organized enough, with enough time, and with our home and our finances in enough order to allow us to commit more than the most minimal effort to trying to do something good. It comes naturally to some at a younger age, and I truly admire those people. I have found that I am a one-thing-at a-time type who needs to have their own ducks in a row before signing on for an ongoing commitment. Better late than never, I hope. We found the first volunteer experience that suited our combined abilities in an email circulated around Bjorn’s office. The option that jumped out at us was the opportunity to prepare a dinner for 8 in our own kitchen at home and deliver it to an emergency safe house for homeless youth, ages 16-21 in our neighbourhood operated by Lutheran Social Services. The guidelines are minimal. Arrive at 7. Bring a main dish (no pork) and a few sides; no mysterious looking casseroles, please. Including a gallon of 2% milk and a bottle of juice is suggested. Dessert is appreciated but not required. We signed up for a few dates to give it a try. I had to ask right away about accommodating special diets: vegetarian, vegan, gluten-free, kosher, etc. We were told they didn’t currently have anyone with those needs. We still tried to come up with enough variety and flexibility in the menu so that a person who doesn’t eat meat, or a person who doesn’t tolerate gluten could still eat a decent plate of food. 1. This is the array of groceries and supplies we used for the first meal we prepared. We spent about $40 on groceries at Target. At my request, Lunds Grocery Store donated 3 disposable aluminum containers with lids for delivering the food. We didn’t shop for this meal at Lunds, but we do almost all of our grocery shopping there. 2. 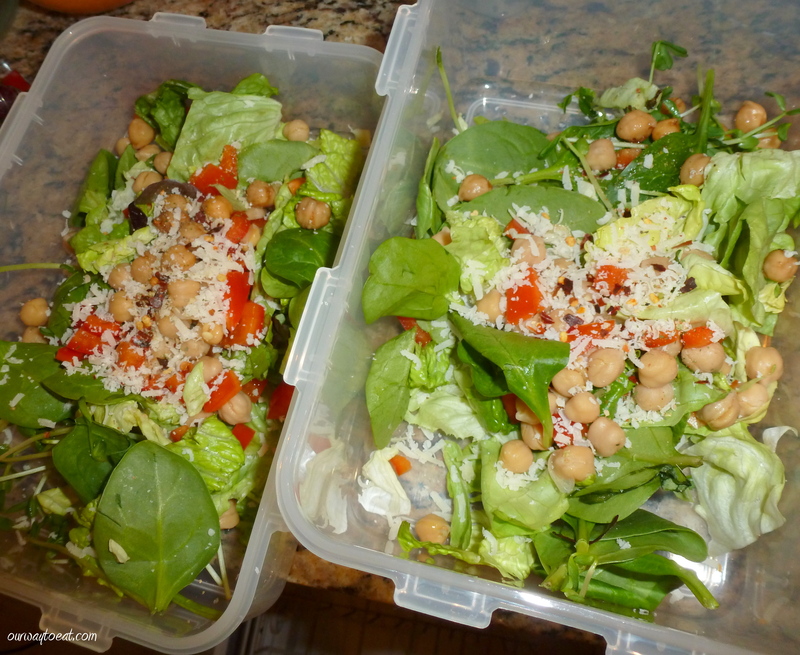 We packed a salad of iceberg and romaine lettuce with sliced cucumbers and julienned carrots. We bought a package of parmesan croutons and a bottle of Ranch Dressing for the salad. 3. This fall, Bjorn’s parents stocked our freezer with a generous supply of ground beef, steaks and a few roasts from cows raised on the family farm by Bjorn’s Uncle Stan. I cannot begin to emphasize how wonderful it is to have a supply of beef raised by a farmer we know and trust. We absolutely love to cook with this beef. 4. I taped the typed-out dinner menu on paper grocery bags we used to deliver the food. 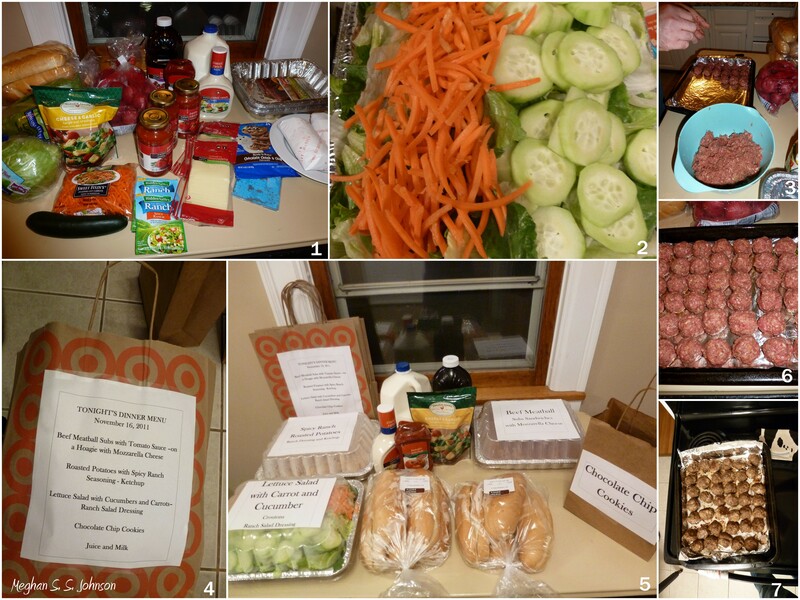 Our first meal consisted of Beef Meatballs in Spaghetti Sauce to be served on Hoagie Buns with Provolone Cheese, Roasted Potatoes seasoned with Hidden Valley Ranch Southwest Seasoning and ketchup, A Salad of Iceberg and Romaine Lettuce, Carrots and Cukes, Juice, Milk and Chocolate Chip Cookies. 5. I tried to think like a caterer when I packed up the meal. 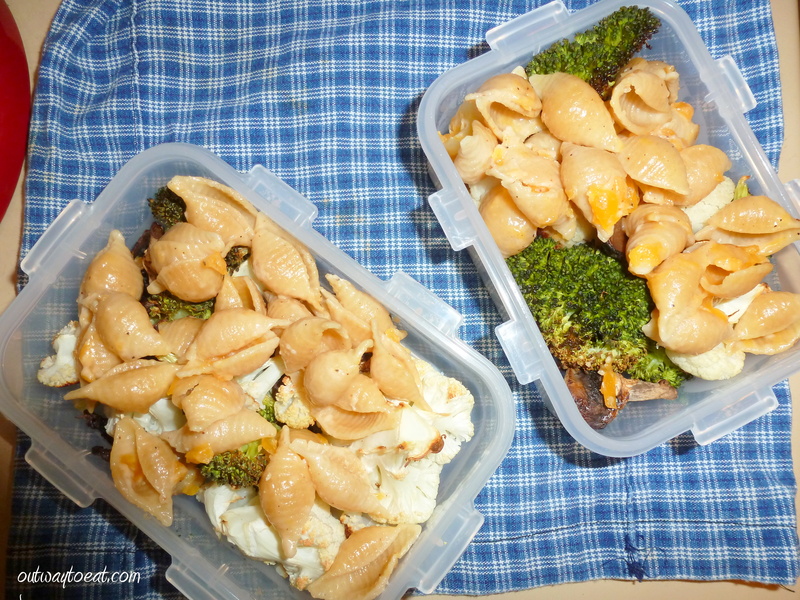 Disposable containers aren’t ideal for food presentation visually, but I think when food is packed neatly, containers are spatter-free and the contents and serving suggestions thoughtfully labeled, it helps a lot. If this is the best meal or the only meal some of these kids are eating today, I want it to be a great meal. 6. Bjorn’s meatballs, ready to bake. 7. Bjorn’s meatballs out of the oven. They smelled good. We prepared and delivered our second meal on November 29. This time when we arrived, we were offered a tour of the house. It was fun and rewarding to see the safe house and some of the people who will eat our meal. The house is large and very clean. We enter through the backyard and after being cleared as “friendly visitors” on the security camera, we enter into the kitchen. After setting up the meal on the large counter, we were led through the dining room which has a large dining table and shelves stacked with board games. The next room is a is a livingroom with a huge, flat screen TV. Upstairs was warm. There were brightly lit bedrooms that were already full of people having a boisterous conversation. The safe house has the atmosphere you would hope: positive, clean, safe and welcoming. We were told that the house is filled to capacity every night. The staff also told us that they appreciate having a meal delivered because they don’t have to cook or go out and buy anything. It saves the program money too, obviously. Judging by our ease in finding workable dates, they are not at capacity for volunteers. They report having a meal provided 4-5 nights a week. They expressed relief that we did not prepare a Thanksgiving meal. Apparently, they had quite a few of those in the past month and were getting a little tired of Turkey and Stuffing. 1. We shopped for most of the ingredients for meal number 2 at Trader Joe’s. Again, we spent around $40. This wasn’t planned, apparently, it is the price-point of the hearty meals we conceive of for 8. The cost would be higher if we had to purchase meat. 2. These are the ingredients to prepare tonight’s meal of Baked Potatoes, Sour Cream, Chili, Mac & Cheese, Roasted Broccoli, Baguette and Butter. 3. I thought the well-labeled meal looked good the first time we delivered it, so I printed a menu and labels with serving suggestions for the second meal as well. This time when we walked in the door with our labeled bags and containers we got a “wow!” from one of the staff. I’m taking that as feedback to indicate that we’re doing okay. 4. We thought Baked Potatoes would be a hearty side, so we scrubbed some russets to bake in the oven. I love russets for baking because their peels gets meaty,chewy and crunchy, and their interior stays fluffy and light. I like to oil the peels and salt them lightly with Kosher salt. 5. 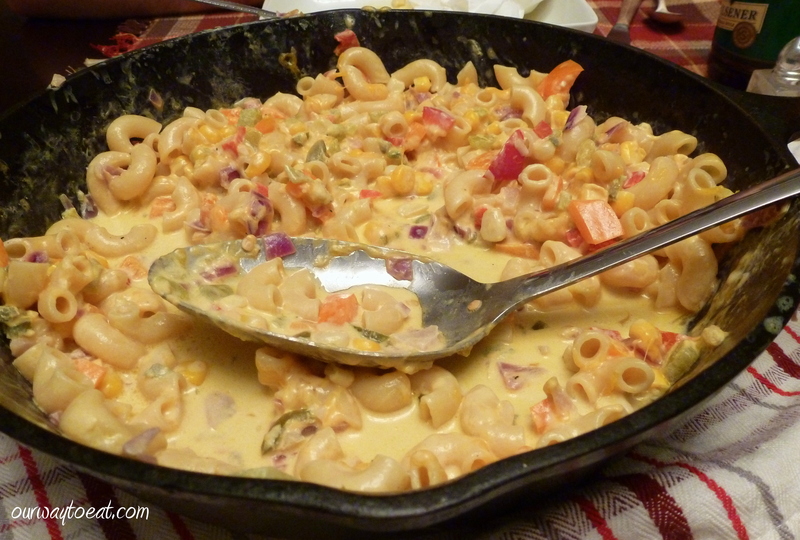 When we have Macaroni and Cheese ourselves, which we do often, it is usually Kraft Dinner. We decided to bump the Mac & Cheese up a few notches and followed Martha Stewart’s recipe for Perfect Macaroni and Cheese. Here, Bjorn is stirring a roux that will become the cheese sauce. 6. We baked the potatoes wrapped in foil which worked well for keeping them warm for delivery in a small paper bag. 7. 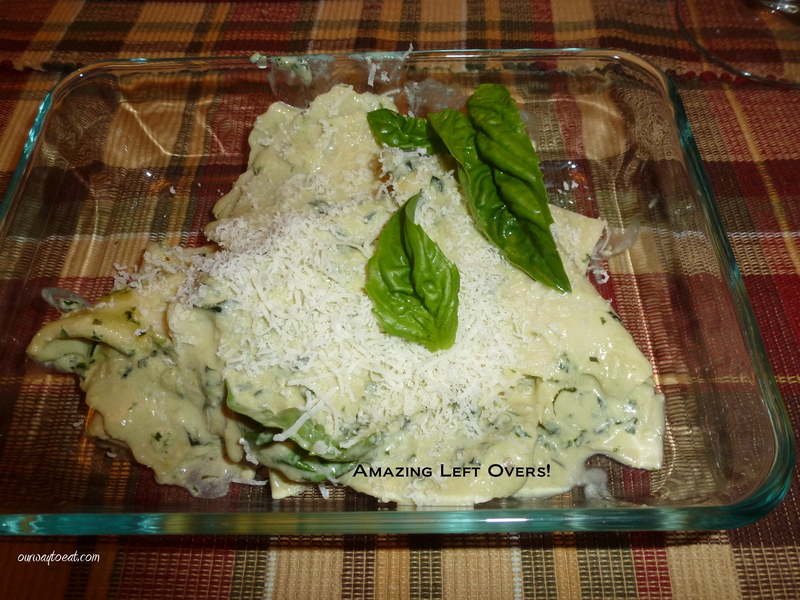 We stirred the cheese sauce into Al Dente pasta, it looked like it was creamy and delicious. 9. Disposable food containers were easy to come by for this meal on the cheap at Walgreens because it was just after Thanksgiving. We had to fashion a make-shift divider out of aluminum foil to separate the Macaroni and Cheese from the Roasted Broccoli. 10. My parents gave us a container of frozen Oatmeal Raisin cookie dough, so we made cookies again this week. My parents also purchase the milk and juice that we bring for each meal. 11. Tonight’s meal is packed, labeled and ready to go. 12. 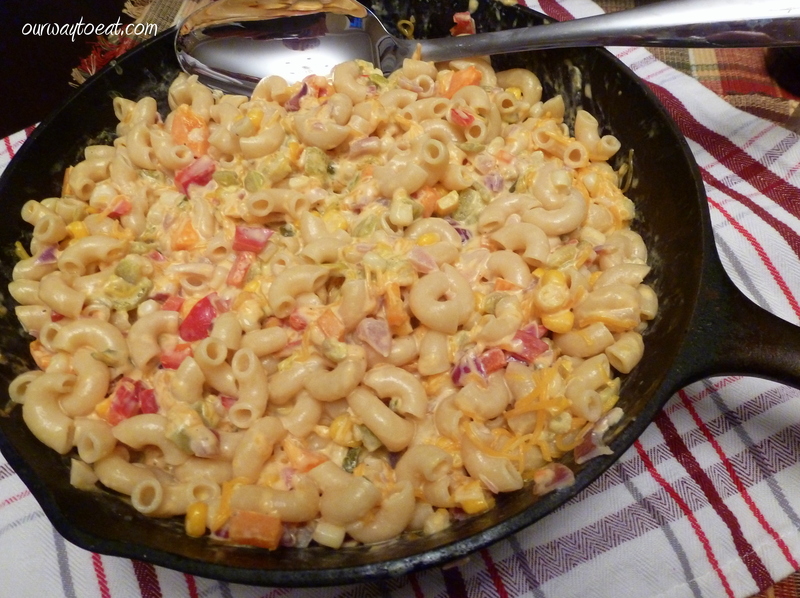 This week, we had the sense to save ourselves a serving a macaroni and cheese. We had it with a salad topped with hard-boiled eggs. 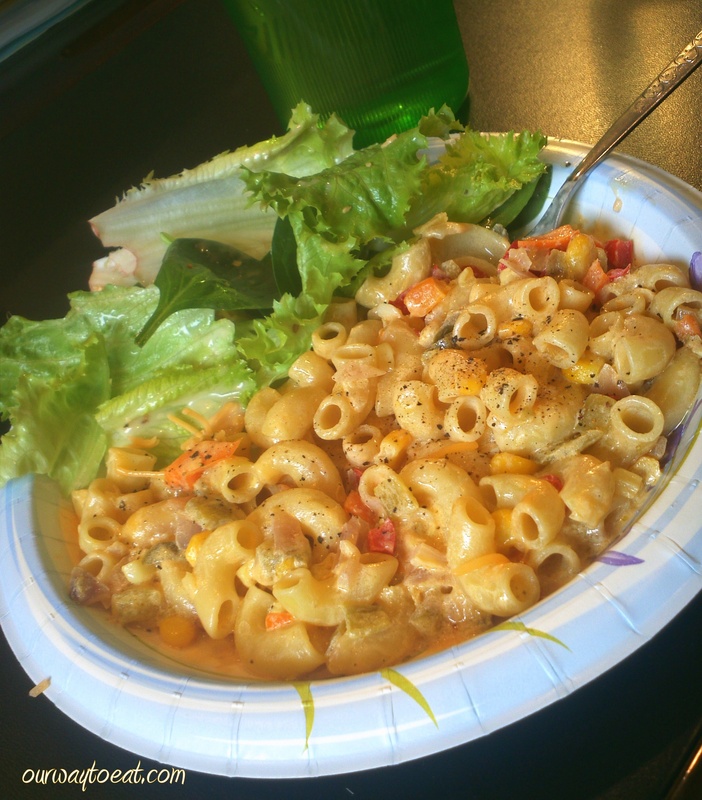 Home made macaroni & cheese is so yummy. We have set “we’d prepare it for guests in our home” as the standard for the meals we prepare for the safe house, and so far, I think we’ve been consistently able to pull it off. Meal Number 3, December 21, 2011. 1. For our third meal we had most of the ingredients and supplies on hand. What we didn’t have, we bought at Target. 2. Bjorn made beef meatballs again. It helps make a substantial meal and keep our costs at a reasonable level when we use our beef. Bjorn has perfected his meatball recipe. He seasons the meat with Trader Joe’s 21 Seasoning Salut and mixes in Egg, Breadcrumbs and grated parmesan, and as I said, they smell great when he bakes them. 3. Meatballs are also convenient because they can be baked a day ahead. After baking the meatballs, Bjorn put them into the crock pot with spaghetti sauce. I take the crock of meatballs out of the fridge and turn it on when I got home from work the night that we deliver the food. 4. We cut up and steamed carrots, broccoli and cauliflower and made a creamy-cheesy sauce with grated cheese, sour cream and mushroom soup, a little pepper and a crunchy panko bread crumb topping. It is creamy and delicious, but really, quite light. After my Mom made the same dish at Christmas with frozen vegetables, I think I would go that route in the future. It was just as tasty, it was probably cheaper and was definitely less work. 5. For dessert I made chocolate cupcakes with cream cheese frosting and Christmas M&M’s. They were yummy. 6. 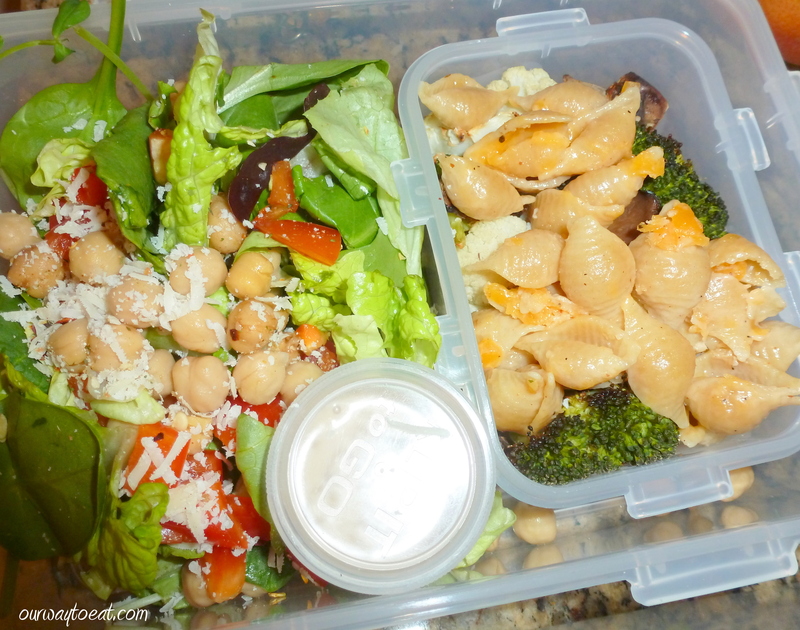 Again, we made a make-shift divider in the aluminum container between the cheesy vegetables and slices of ciabatta bread. 7. We boiled farfalle pasta to go along with the meatballs this week. I made a last-minute call to Kowalski’s on Grand Avenue in Saint Paul to see if they would be willing to donate some disposable containers for us to deliver the meal in this week. I barely had to finish my sentence explaining what we were doing and what we needed before the manager agreed to set out several nice, durable aluminum containers for me to pick up. Those really aren’t cheap, so it helps us a lot. It has been amazing to discover how generous store managers in our neighbourhood are when we just ask. Not pictured with this meal are the Christmas cards that we brought along with our meal this week for the kids and the staff, each containing a $5 Subway gift card that we bought and a free 6 inch sub donated by the owners of Subway on Grand and Fairview Avenues and Selby Avenue and Victoria Street in Saint Paul. This was another example of how people are ready to help and be generous when all we do is ask. 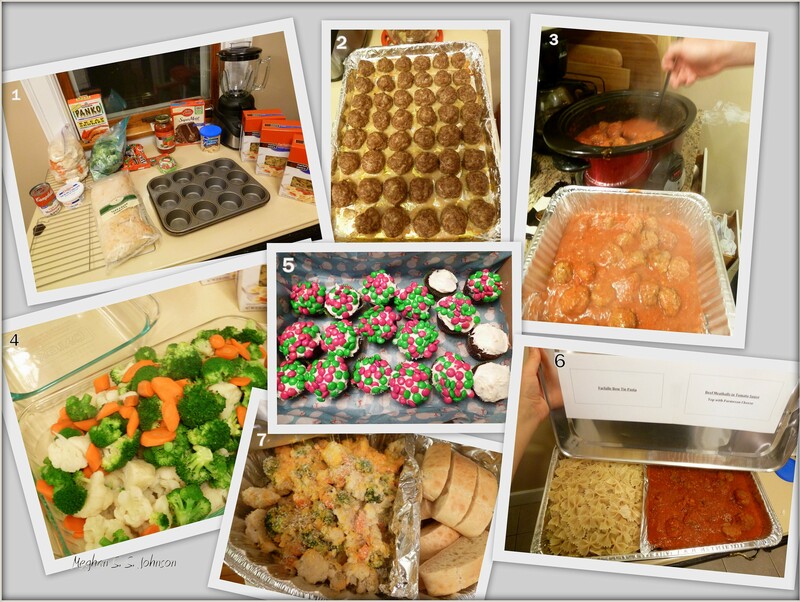 We thought our first 3 meals were a success, so we signed up to prepare and deliver 2 more in January. We are enjoying the new experience of giving a little time, and at the same time getting to be creative and engaged in a favorite hobby: cooking!